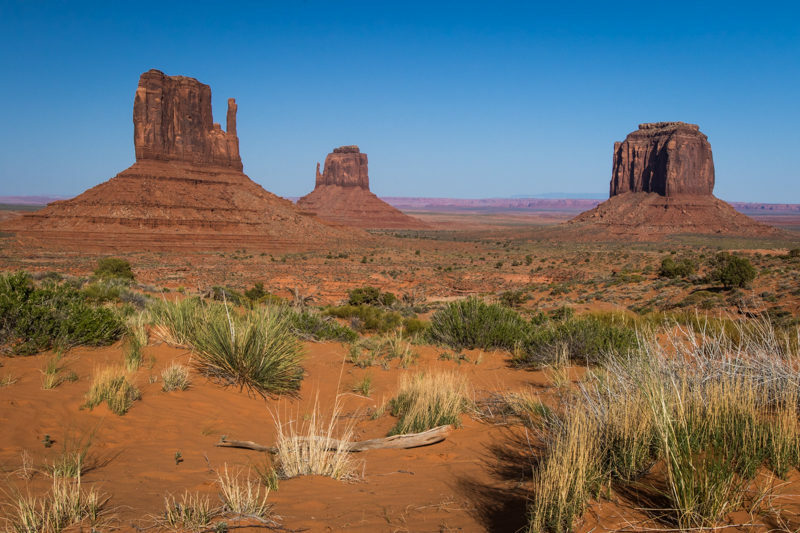 We arrived at Monument Valley’s ‘The View’ campground early in the afternoon. About a third of the pull through spots face cabins. Another third faces the restroom, office and tent campground. The last third has a beautiful view of the monuments. Fortunately, we were there early enough to pick a prime spot. 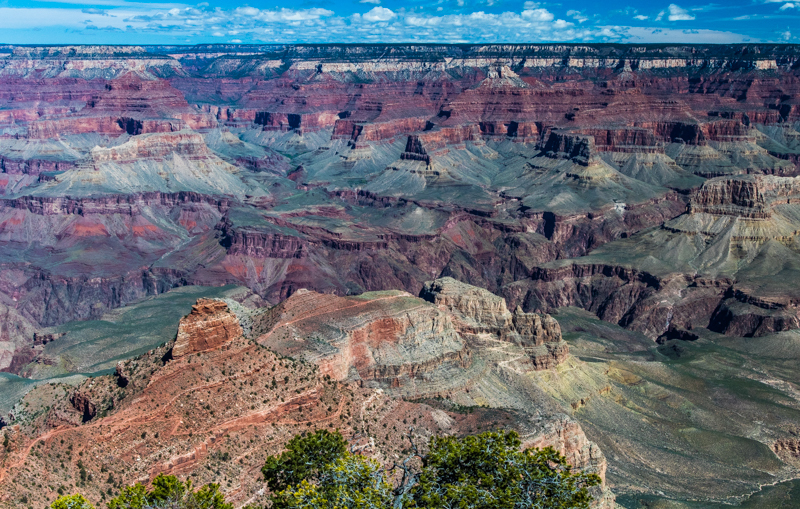 If you stay at The View campground consider that there is a $20/car fee to enter the Navajo grounds. This is over and above the campground cost, and they state that it is a per day fee. 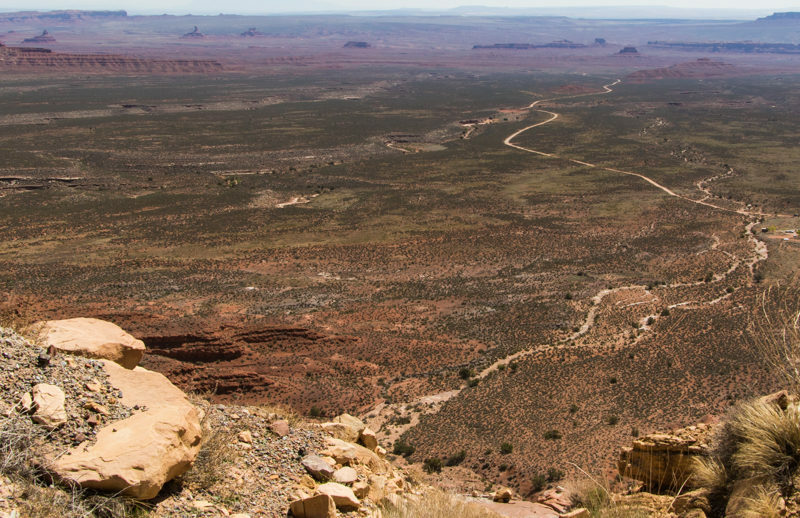 After parking the RV we jumped in the Jeep and began our self-guided tour through monument valley. The 17 mile scenic drive was very bumpy and dusty, but the beautiful views made it worthwhile. Sunset from our prime spot was spectacular. 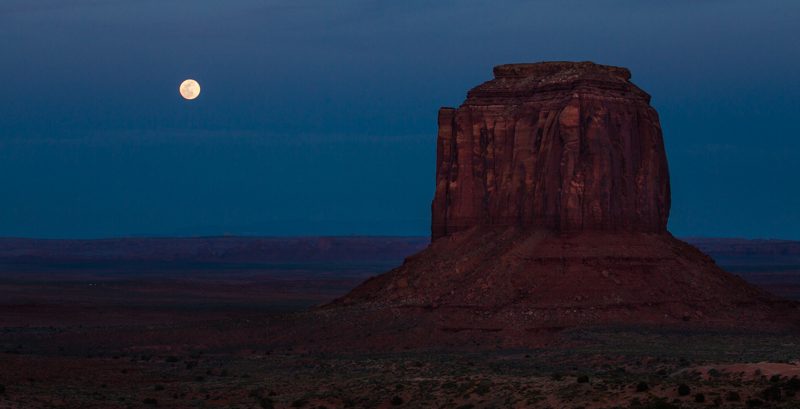 Immediately after sunset there was a full moon rising between the monuments. Charlie had been sick through most of our stay in Page, AZ, to the point where he finally visited the ER room before we departed for Monument Valley. He was starting to feel a little better at Monument Valley but he passed his cold onto me. 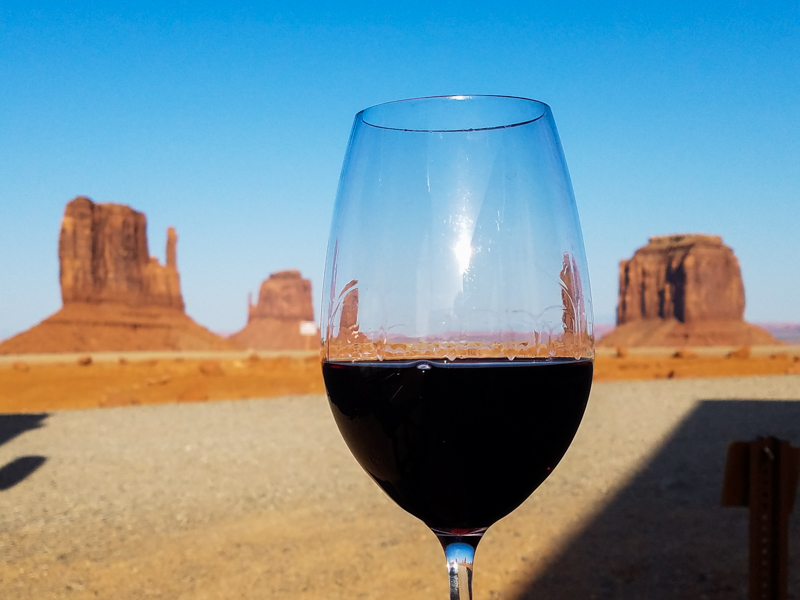 Therefore, we spent our first full day at Monument Valley resting in the RV. We went out for a short walk and about collapsed with exhaustion. We were miserable. The next day we were still moving slowly but felt compelled to get out and do some sightseeing. We headed up into Utah. 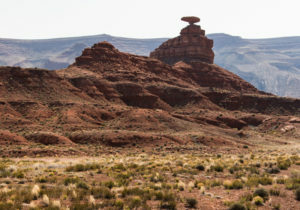 We stopped in Mexican Hat to get a picture of the iconic stone. We also stopped for breakfast at a great little café on the river: Olde Bridge Grill Café. 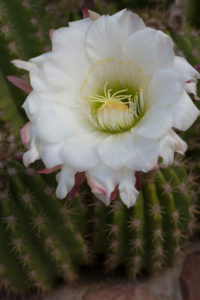 Next to the café was a beautiful blooming cactus. From there we went to the Valley of the Gods. We toured along the 17 mile bumpy and sandy road. Thankfully, it was a bit smoother than the one in Monument Valley. 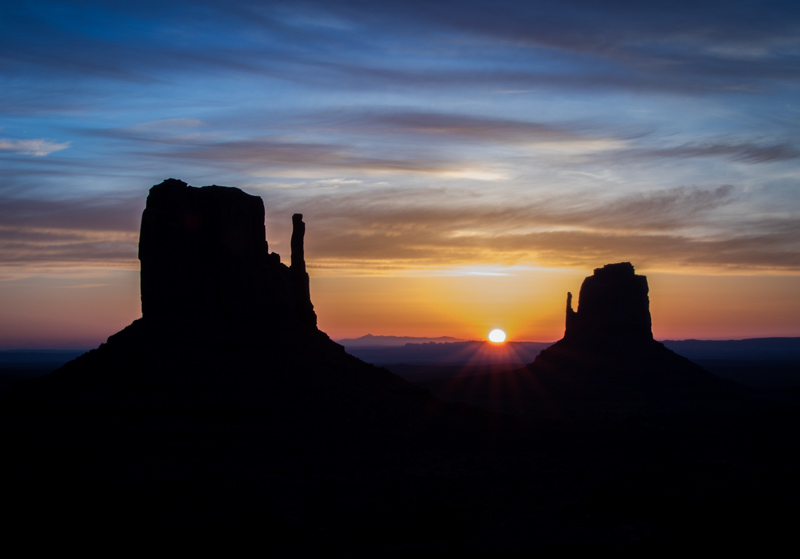 Valley of the Gods is considered by some to be a mini Monument Valley. 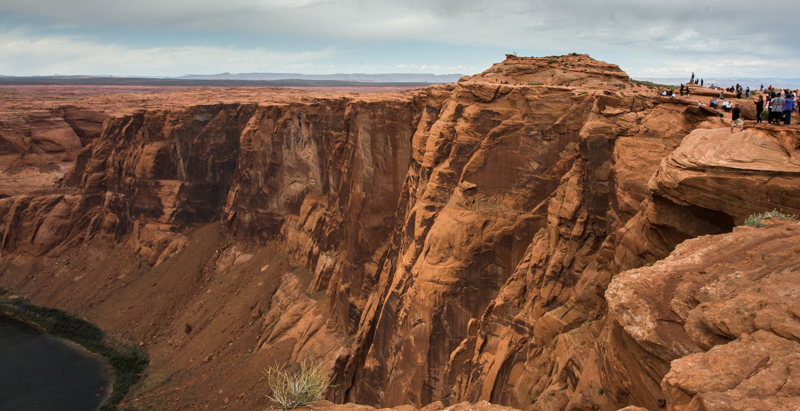 However, we felt that the buttes, towering pinnacles and mesas of Monument Valley were far more spectacular. 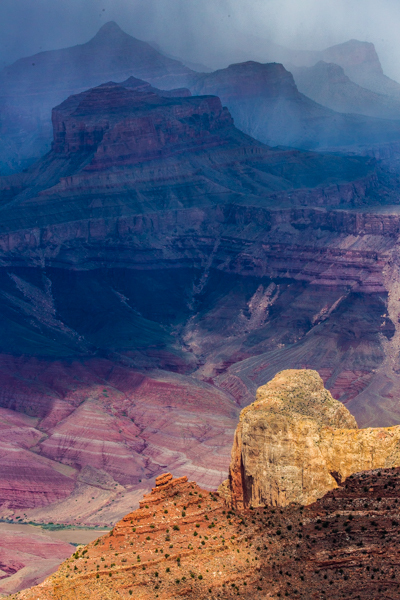 That’s not to say that Valley of the Gods isn’t beautiful in its own right. 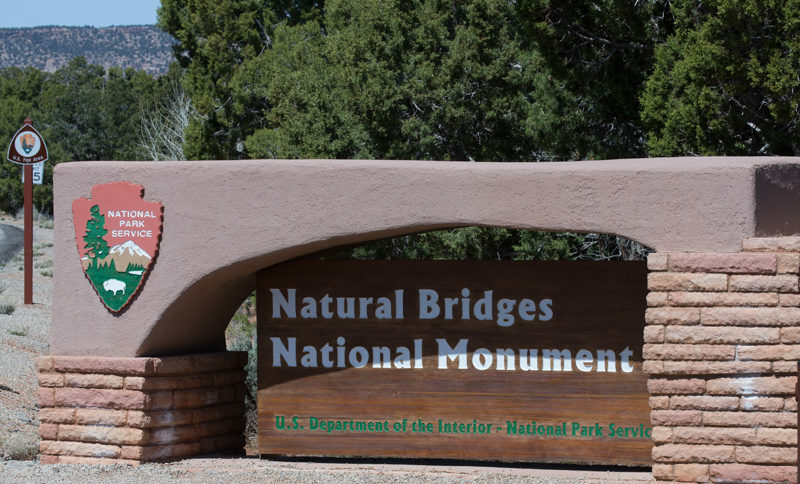 Our next stop was Natural Bridges National Monument. 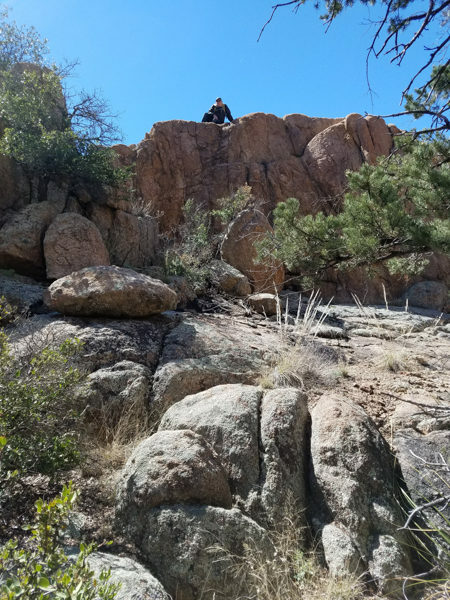 In order to get there we had to climb up this huge mesa, along Hwy 261. 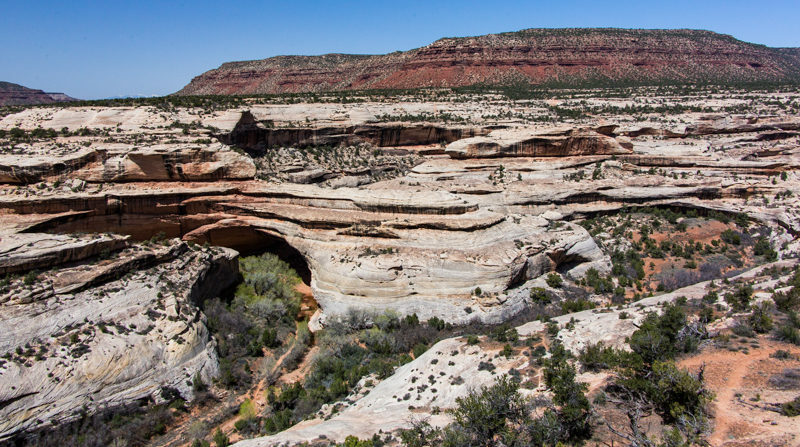 Natural Bridges National Monument is Utah’s first national monument. 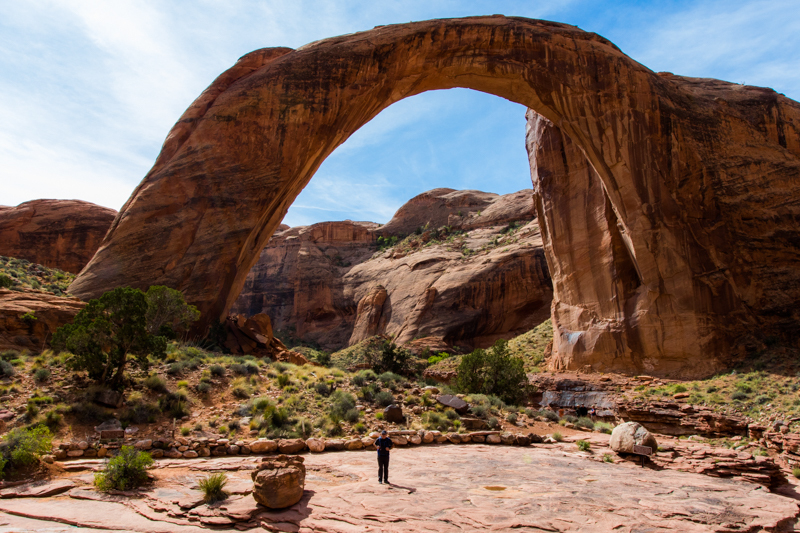 Within the park there are three majestic natural bridges. We took the loop drive to view the bridges. I think the view from down in the valley would have been very nice. However, neither of us had the energy to take any type of hike, especially considering the higher altitude we were at. 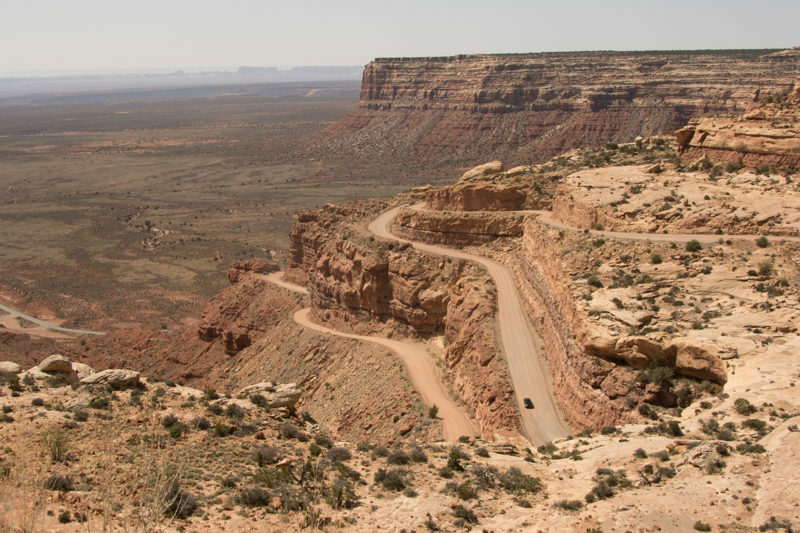 Our final stop for the day was at Utah’s Gooseneck’s State Park. 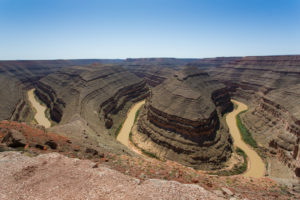 Here you get a view of the San Juan River making numerous tight turns around a canyon landscape that resembles goosenecks. That wrapped up our stay at Monument Valley. Still feeling under the weather, it was time to move on. 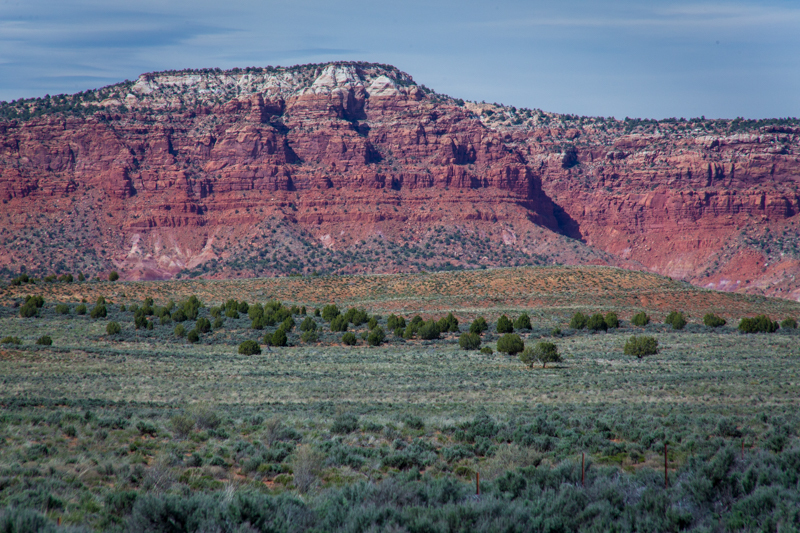 We packed up and headed to Santa Fe, NM, with a short stop in Chinle, AZ. 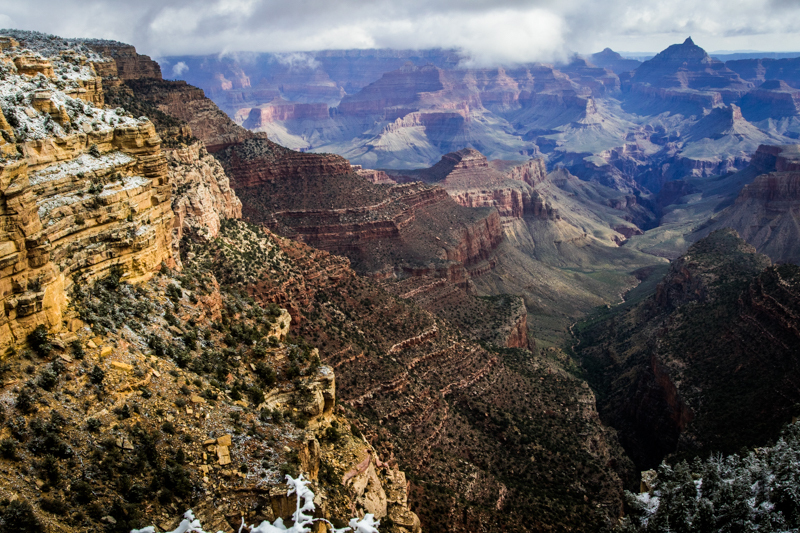 More on that later…..
We left the Grand Canyon South Rim and headed for Page, AZ on a very dreary day. 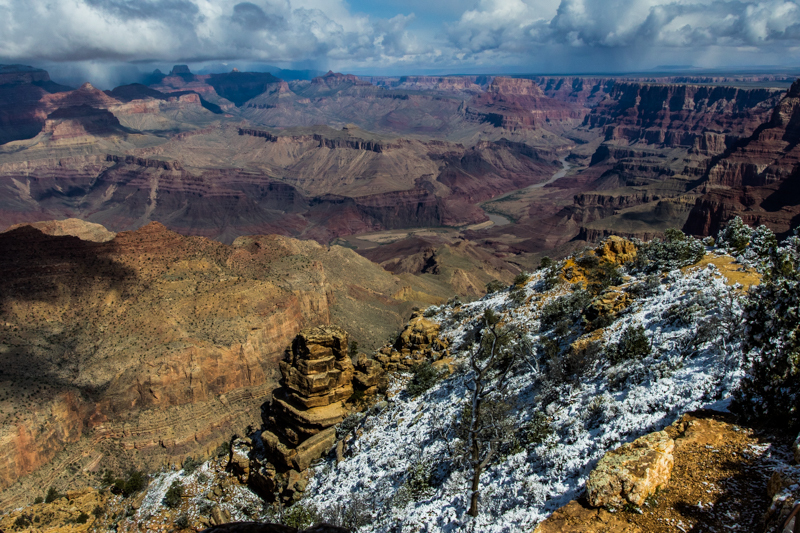 Snow was forecasted for the South Rim and rain for Page so we got an early start. 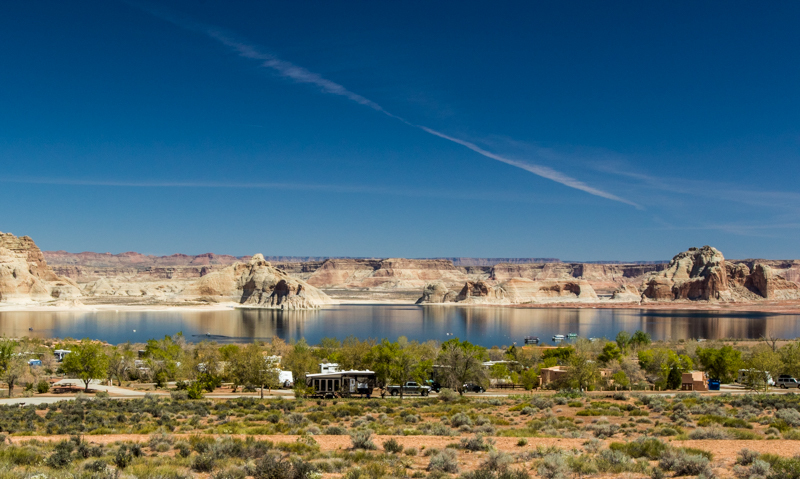 We arrived at the Wahweap Campground, right on Lake Powell, early in the afternoon. As soon as we parked the RV the rain started and it continued until around midnight. 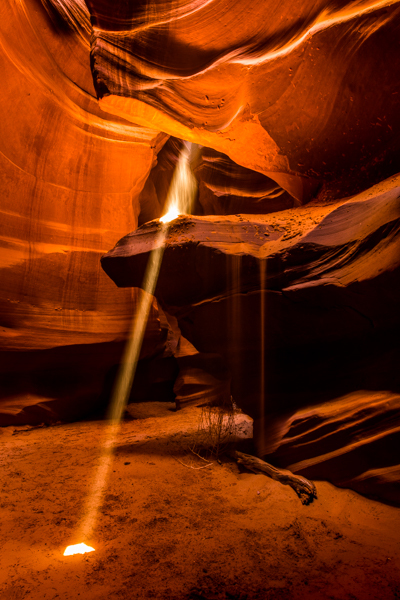 I was worried that with so much rain our pre-planned Antelope Canyon tours would be cancelled the next day. The view from our campsite was very nice. 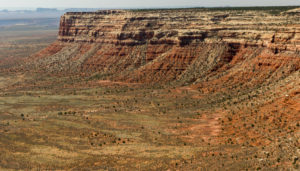 Below is a picture from a lookout above the campground. The water level of the lake is very low in the winter, compared to summer. They expect the level to rise 40-50 feet over the next couple of months, once the snow in the mountains upstream begins to melt. 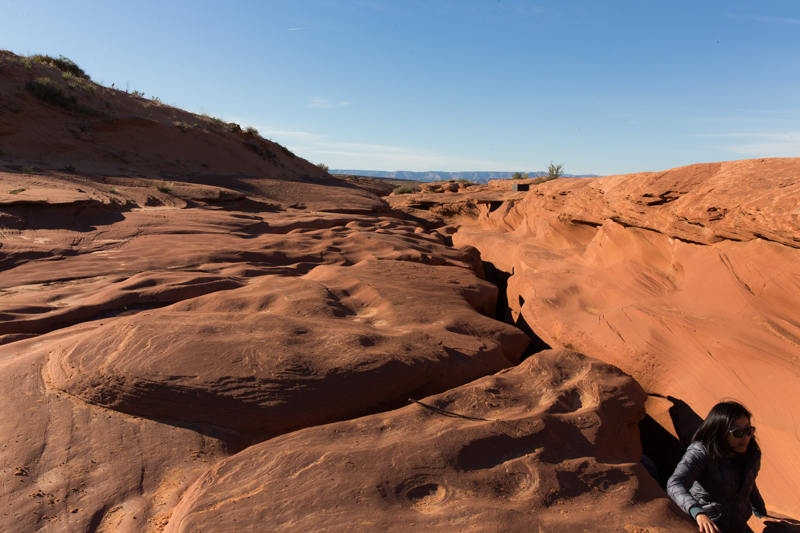 We awoke the next morning to beautiful blue skies and headed over to the Antelope Canyons. 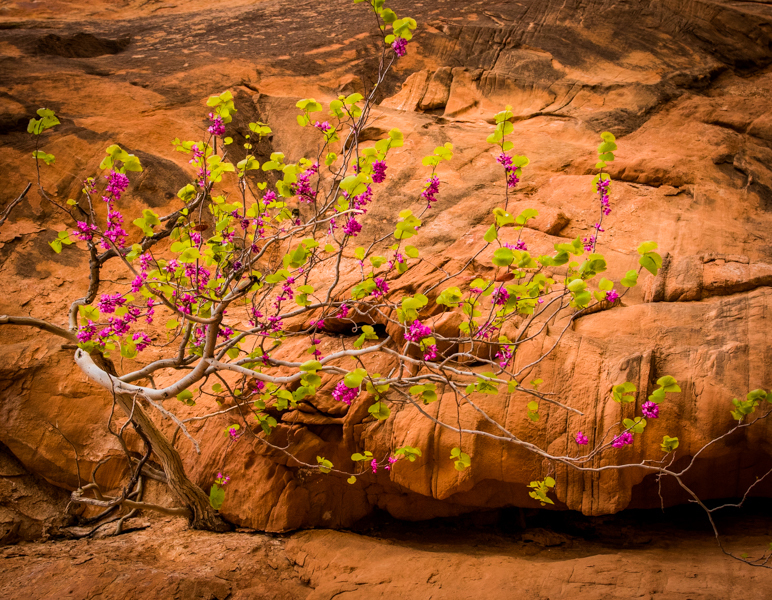 I was scheduled for a photography tour of the Upper Antelope Canyon, while Charlie was scheduled for a general tour. 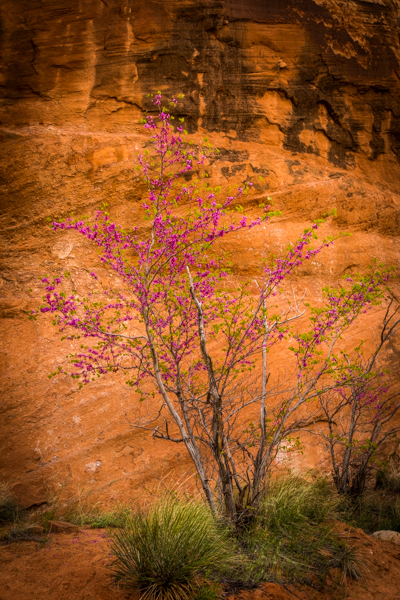 The photography tour allows you to carry a tripod, and the guide keeps people out of your photograph. 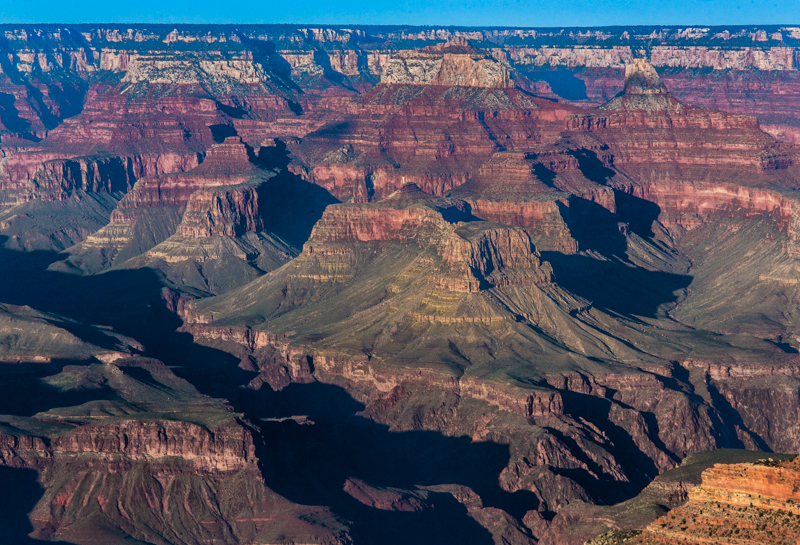 We took the 10:30 am tour so that we would be in the Upper Canyon when the beam of light came through. 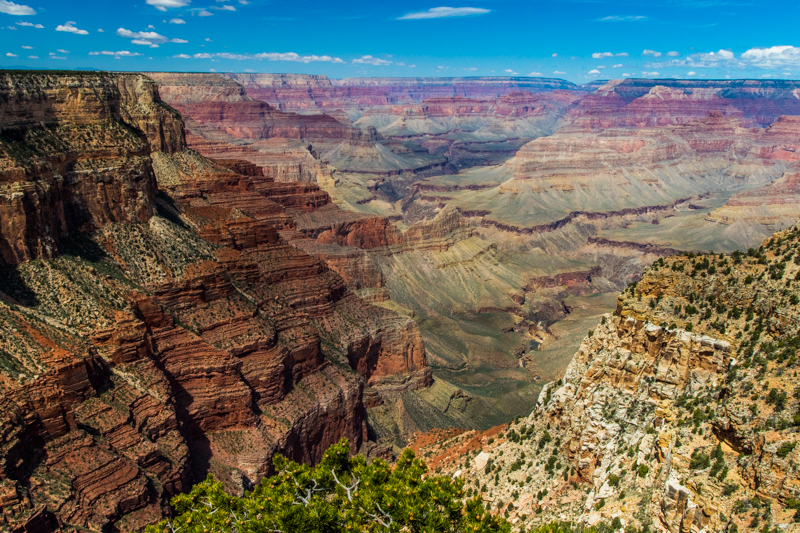 We both enjoyed our tours, but the canyon was jam packed with people and that kind of takes away from its surreal beauty. 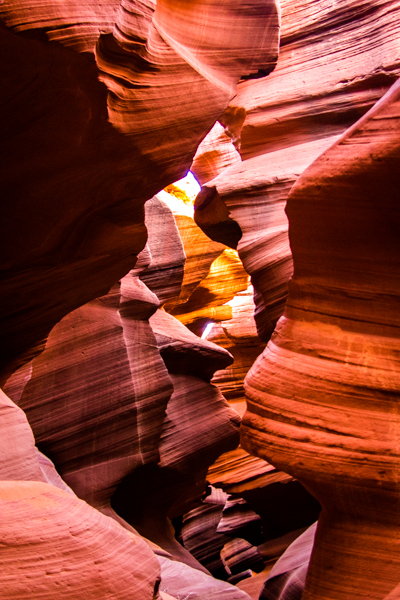 After visiting the Upper Antelope Canyon we grabbed lunch and then headed over to the Lower Antelope Canyon for a slightly different tour. 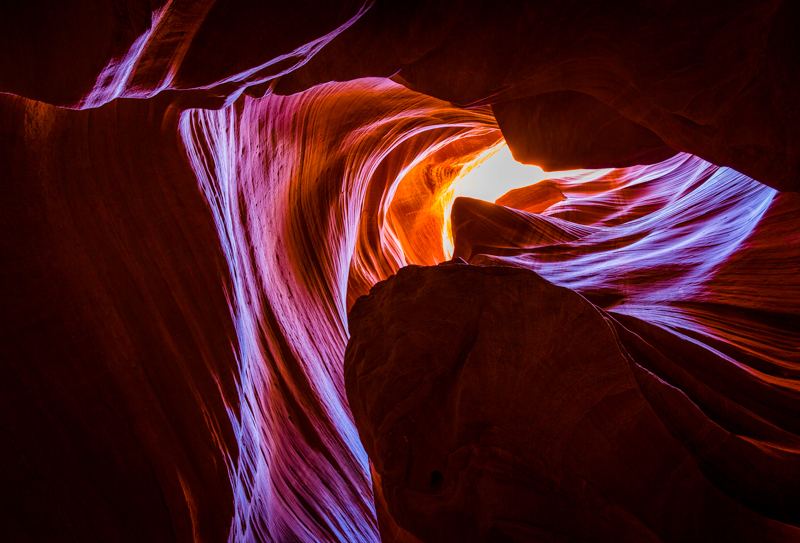 There are no longer photography tours allowed in the Lower Antelope Canyons during this time of the year so we were both on the general tour. This meant that I could not use my tripod and therefore, could not get good detail throughout most of my photos without using a very high ISO. 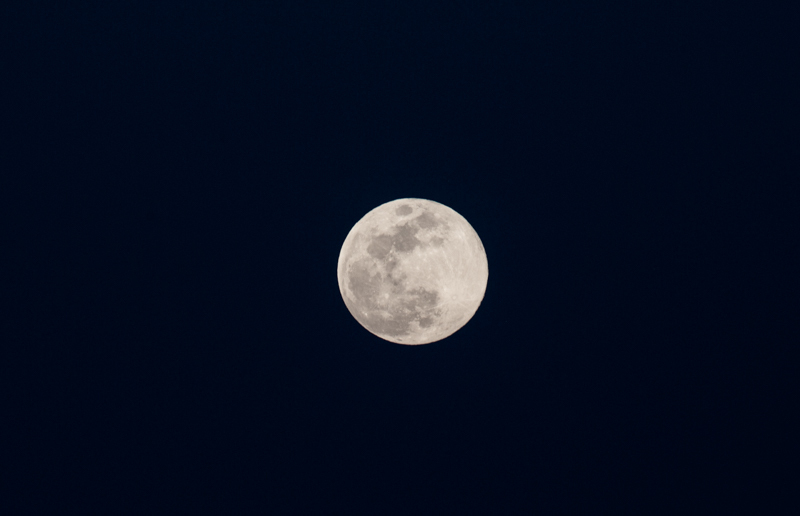 Regardless, I did manage to get a few good pictures. 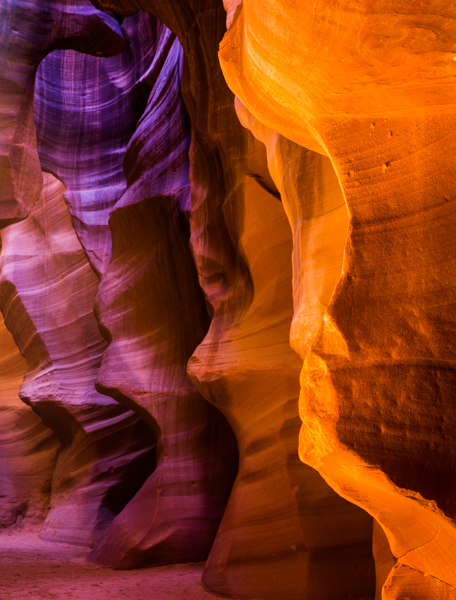 I found the Lower Antelope Canyon to be more visually spectacular than the Upper and I would definitely like to come back during the off-season, when the crowds are thinned out and I can take in my tripod. 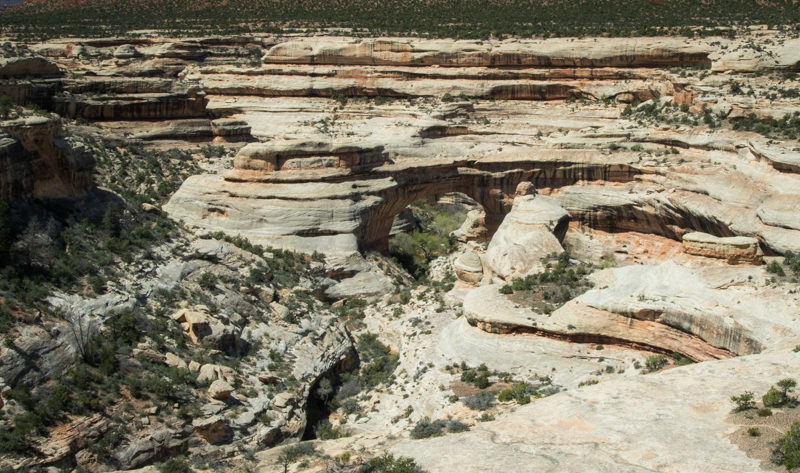 The picture below is interesting in that you can see a lady exiting the canyon. 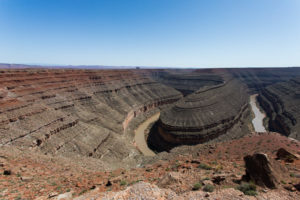 The canyon is behind her and seen as a very narrow slit in the rock. 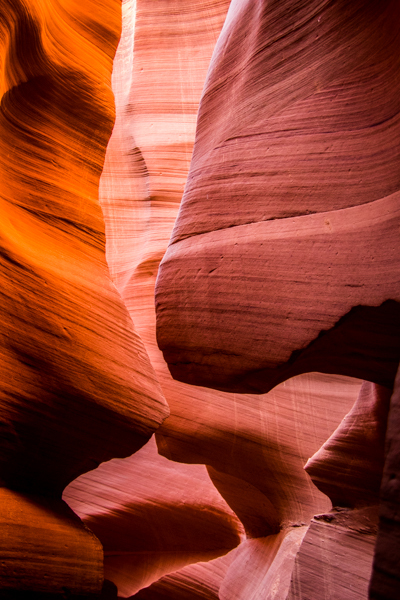 By the time we finished our Lower Antelope Canyon tour it was getting close to sunset. 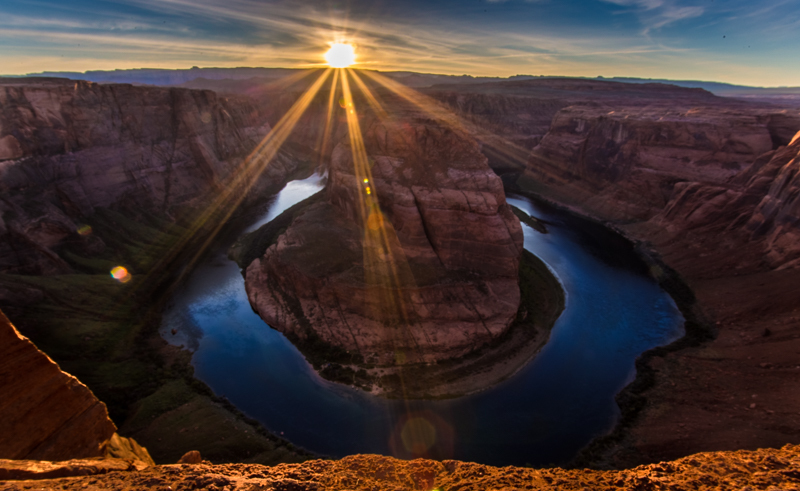 Horseshoe Bend was on my agenda for photographing at sunset. 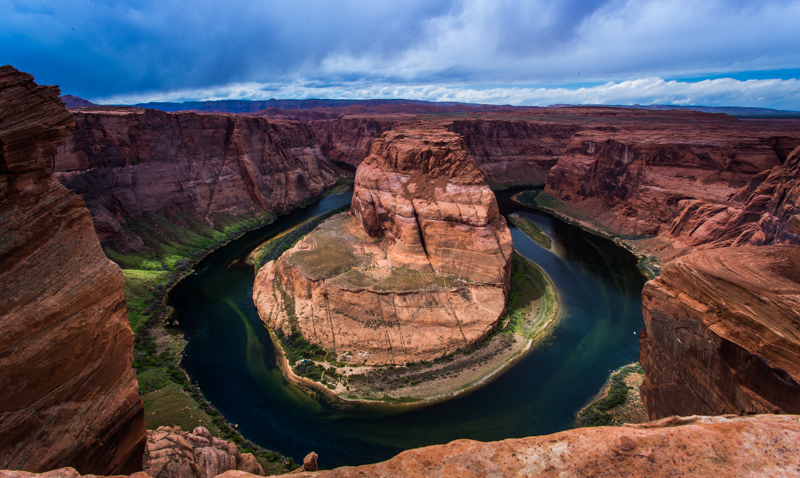 Horseshoe Bend is an iconic place, where the Colorado River meanders around a horseshoe-shaped bend in the canyon. It is a breathtaking view from the top of the ridge. 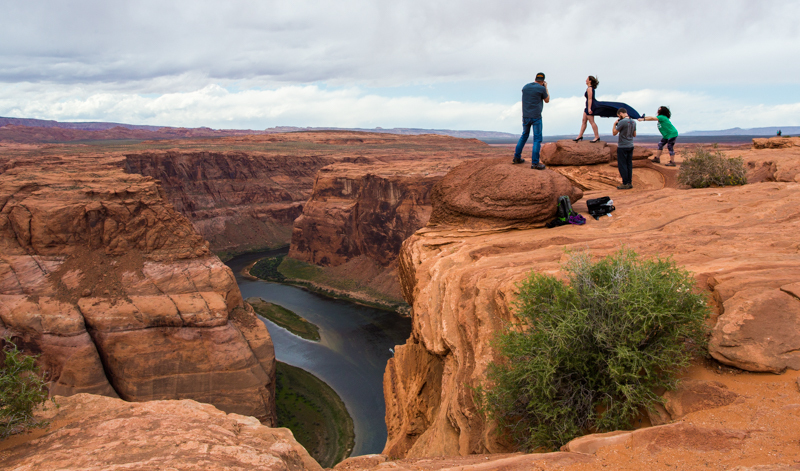 It can be quite windy and people tend to take extreme risk venturing out on the rocks, which hang precariously 1,000 ft above the river, for that perfect selfie shot. They have had a number of people fall to their death over the years. I did get right up to the edge, but on my hands and knees. It was far too windy for me to stand there. I returned to Horseshoe bend a couple days later for a cloud covered afternoon shot. It was even windier and there were even crazier people out there. Consider this woman in her high heals standing on a rock for a photoshoot. Here is another shot, with a different perspective. Look closely on the highest peak and you can see people standing there. On my way back to the car I spotted this bike and was impressed that the owner was pedaling across the country. The sign on the back says ‘Cross Country’. 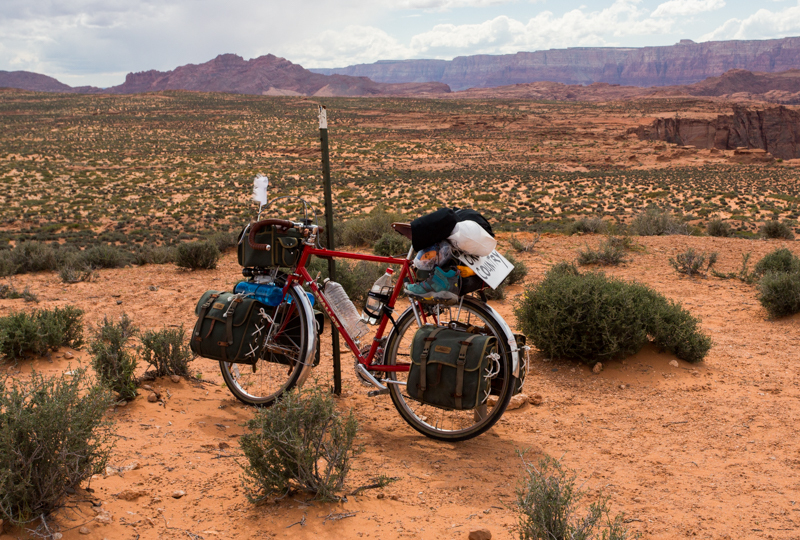 The funny thing is that a couple days later, when we were moving the RV from Page to Monument Valley, we passed this bike (with his owner riding it) on the road. Charlie was starting to come down with a cold and was quite exhausted by the end of the day. It was our 1-year anniversary with the RV and last year when we picked it up (literally to the day) Charlie came down with an allergy-influenced cold, which stayed with him for 7 weeks, the entire time of our first RV trip. We were not looking forward to anything like that again. 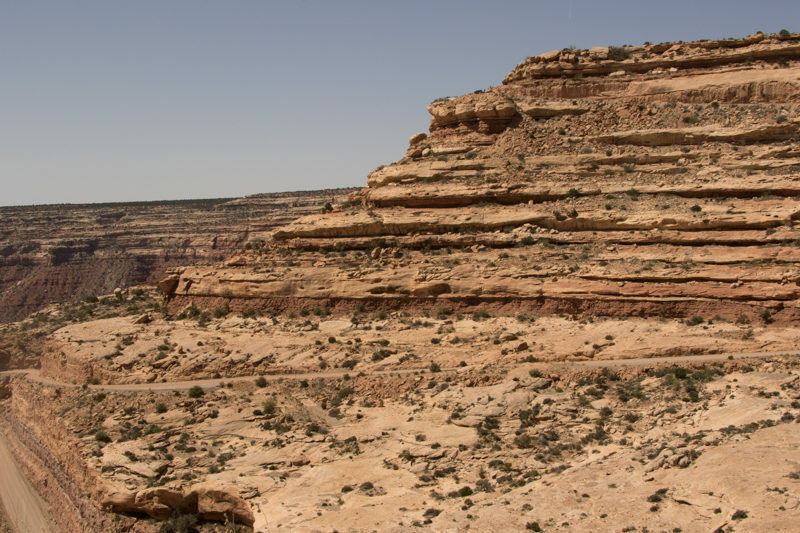 In an effort to take it easy, we took a scenic drive from Page to Kanab, UT via Hwy 89 and then from Kanab back to Page via Hwy 89A. 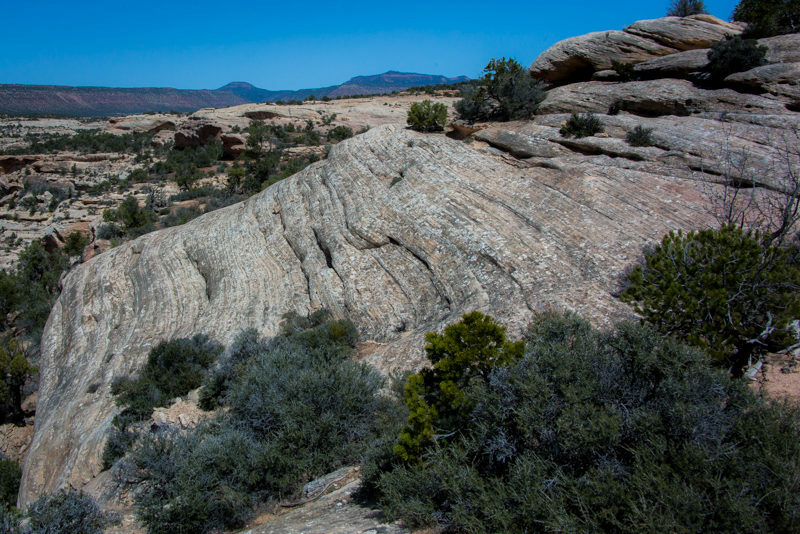 On the way to Kanab, just west of Big Water, we stopped in the Grand Staircase-Escalante National Monument for a short hike to the Toadstools. 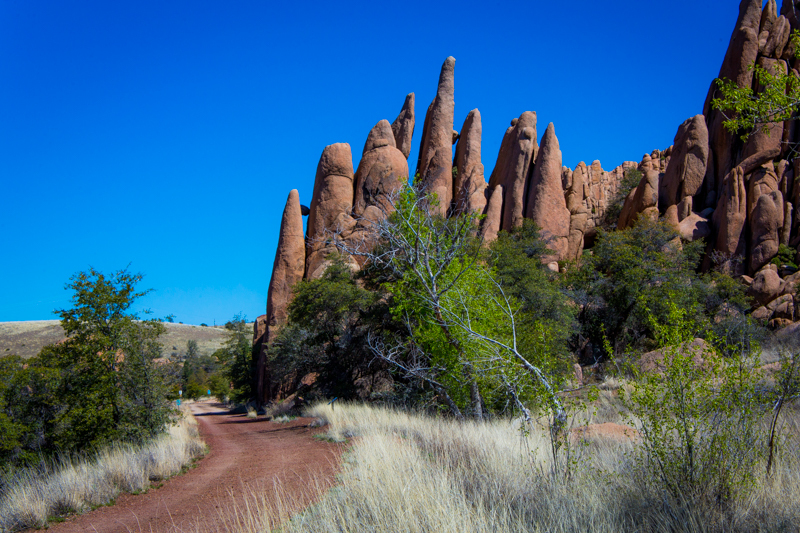 These are balanced rock formations, which look like mushrooms. We had hoped to be able to hike to the Wahweap Hoodoos as well. However, Charlie was feeling quite under the weather and it was a much longer hike so we decided to put that off for a later date. 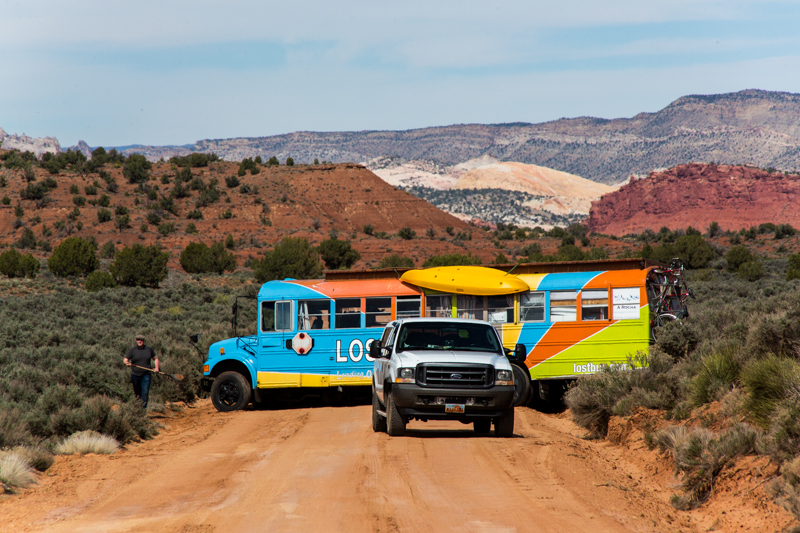 Further down Hwy 89 we turned onto a dirt road to visit the historic Paria movie set. The movie set depicts a “western town”. 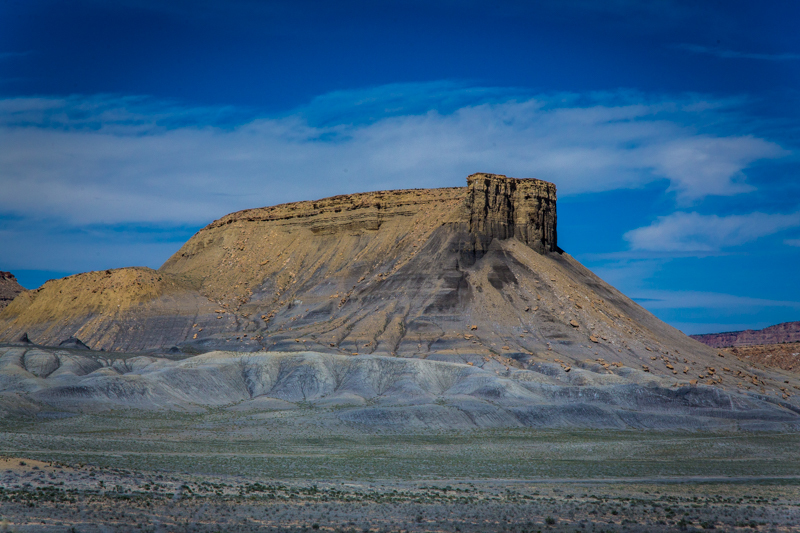 It was built in 1963 for the film, “Sergeants Three” and later used for other movies, including Clint Eastwood’s “The Outlaw Josey Wales”. However, shortly after we turned onto the dirt road we found this bus blocking the road! Not sure what he was thinking. While we didn’t make it to the movie set, we did get to take in the beautiful surrounding scenery. We continued on our journey with a final stop in the Lee’s Ferry area, off Hwy 89A. 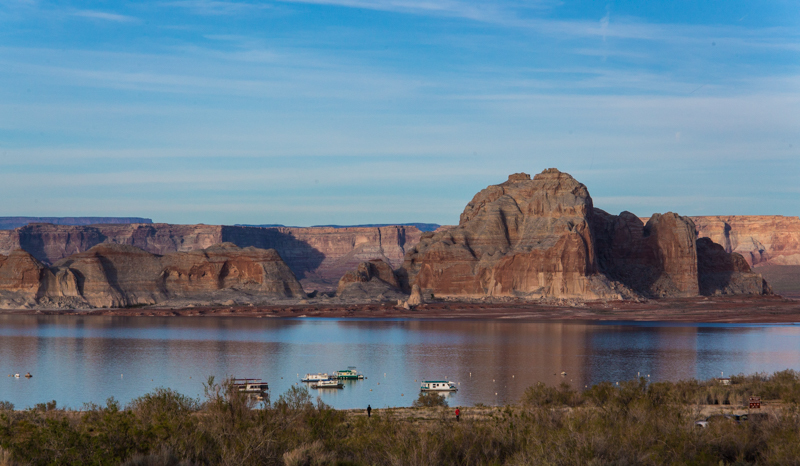 This area brought back memories for Charlie, as he took off on a 2 week rafting trip out of Lee’s Ferry some years back. 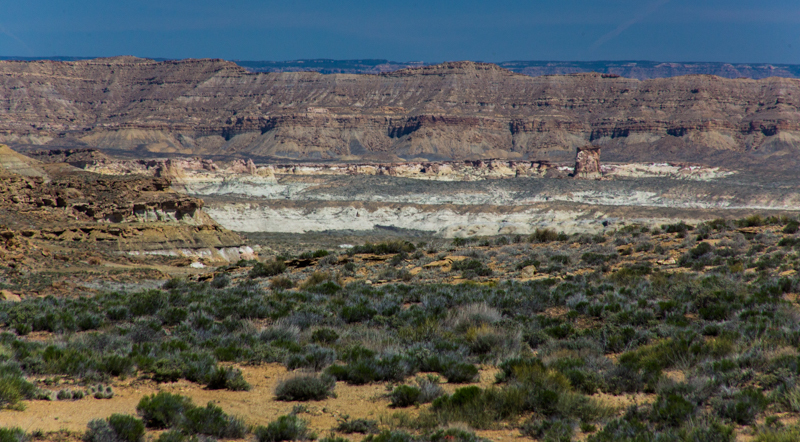 The surrounding area, of Marble Canyon, is very picturesque. 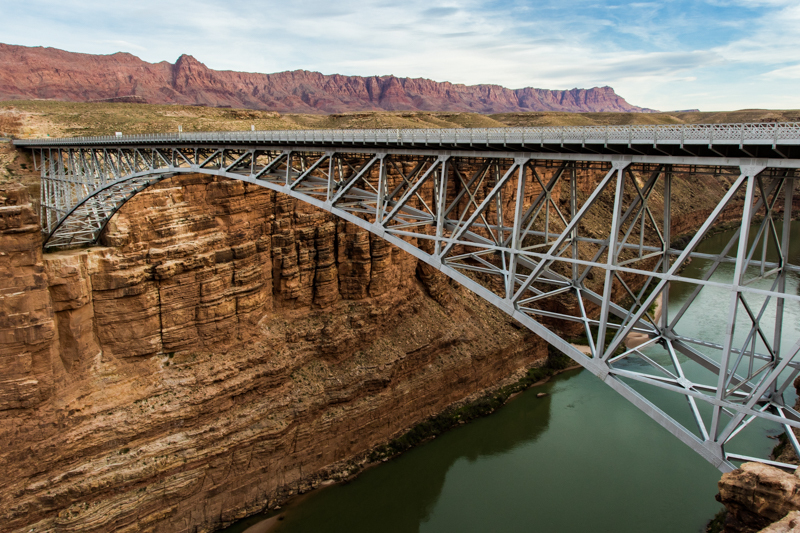 Below are pictures of the Navajo Bridge in Lee’s Ferry. The original bridge was completed in the 1920s. 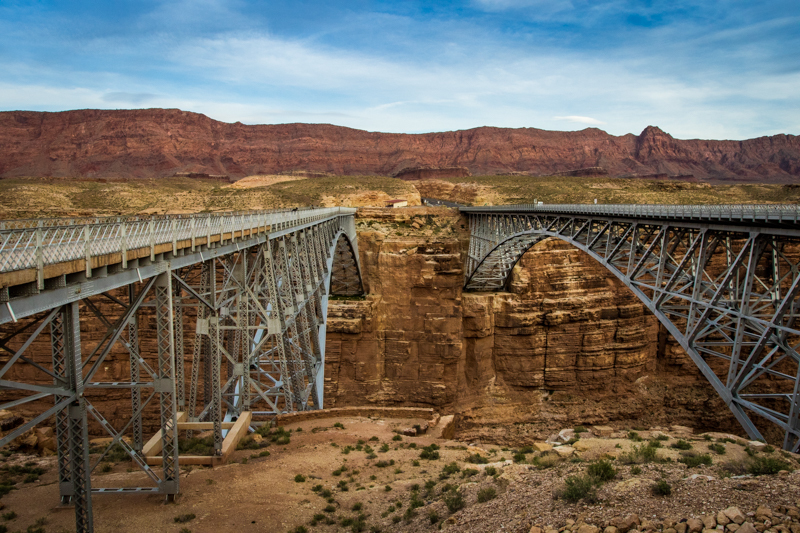 By the 1990s it was concluded that a wider bridge was needed, and that the original bridge did not meet modern day federal highway requirements. In order to resolve the issue they built a new bridge right next to the old one and made them look nearly the same. One is used for vehicle traffic while the other for foot traffic. 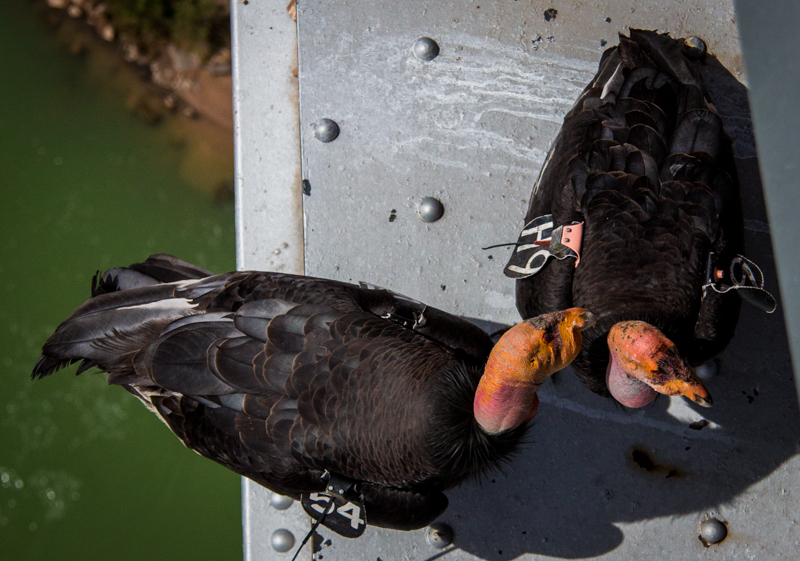 Under the foot traffic bridge I found a couple of California Condors hanging out. 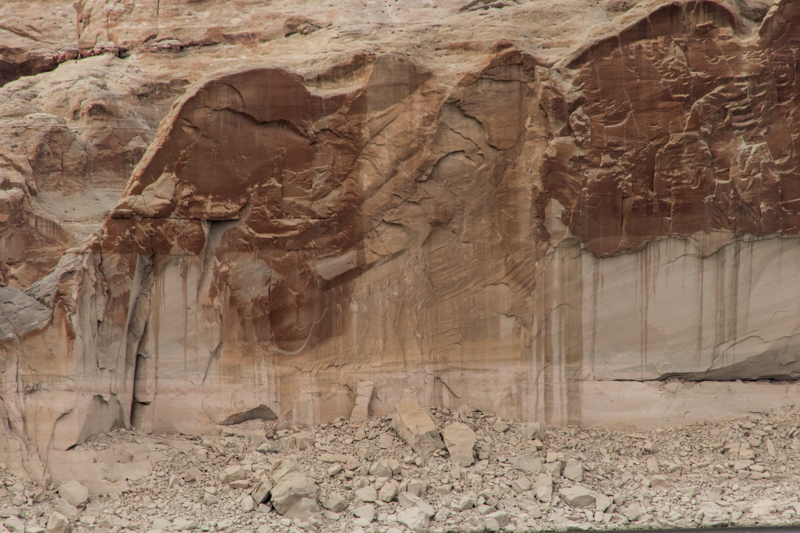 While in Page, we enjoyed a tour of the Glen Canyon Dam. They had just opened up a brand new interpretive visitor’s center. They did a great job with it. 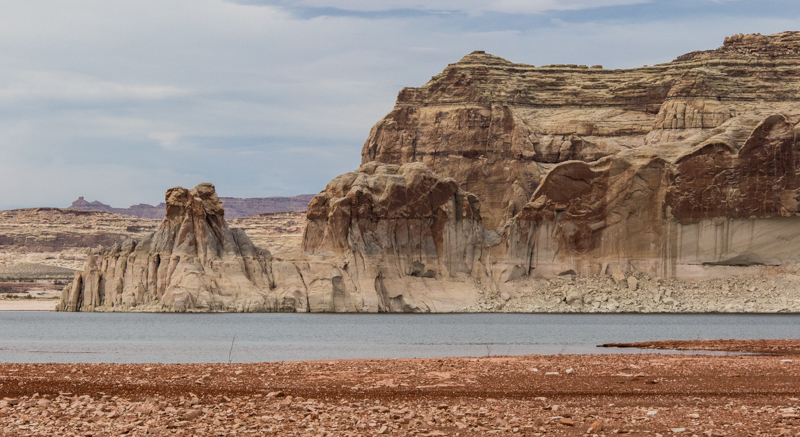 We spent a day taking a boat ride on Lake Powell, over to Rainbow Bridge National Monument. 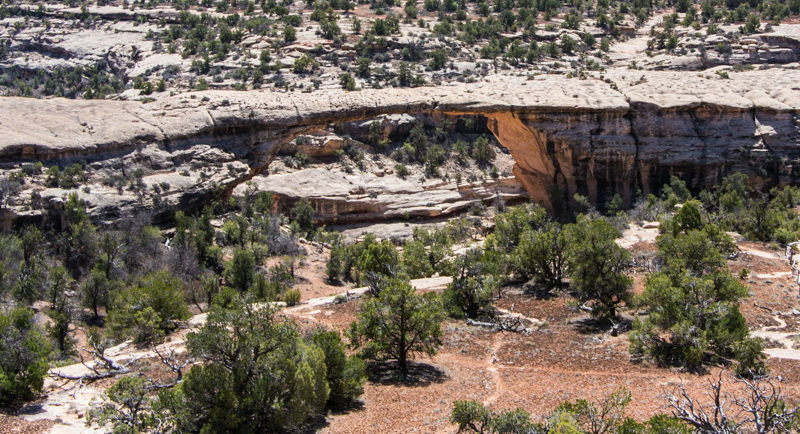 This bridge is one of the world’s largest known natural bridges. The bridge stands 234 ft tall. At the top it is 42 feet thick and 33 feet wide. I found a little creature on my walk up to the bridge, as well as some pretty purple flowers blooming. 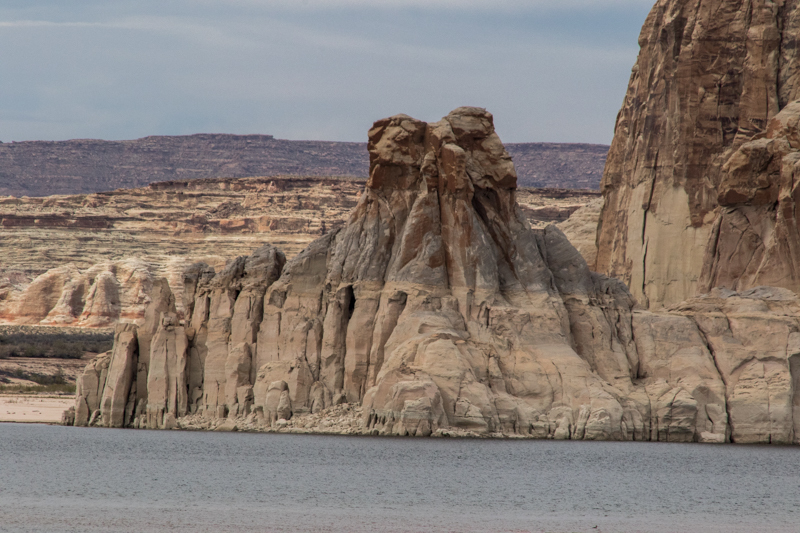 The rock formations seen along the boat ride were also very interesting. These rocks were especially interesting. Look closely and you can see an owl and an elephant. Can you see the Owl and Elephant? 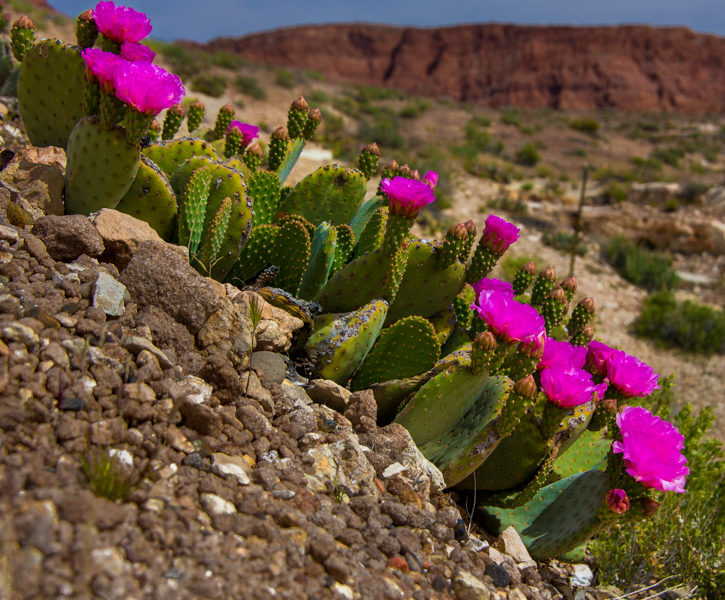 During our stay in Page I found a few blooming cactus bushes. 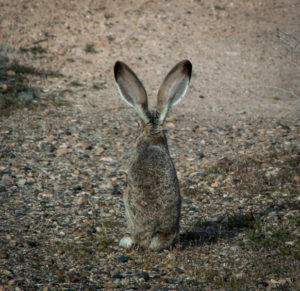 Outside our RV we spotted lots of Jack Rabbits. This one refused to look at me. I loved his ears though. 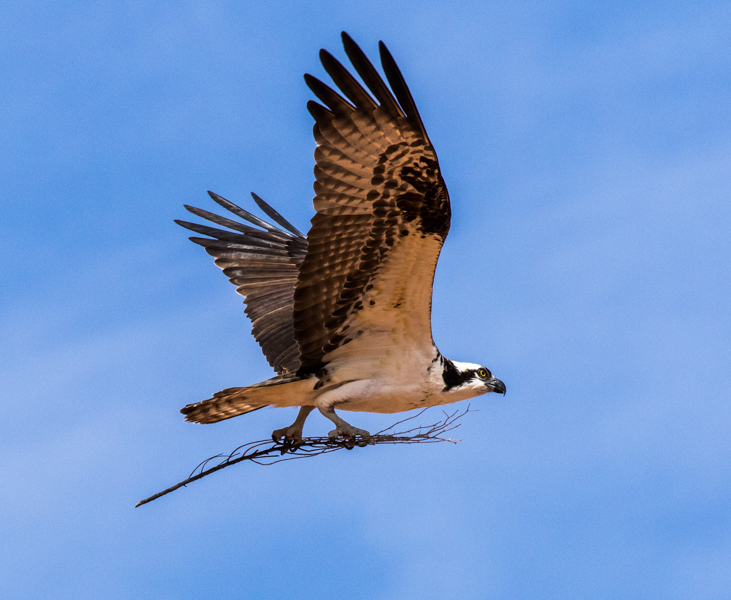 On our final day in Page, just before our departure to Monument Valley, I spotted a couple of Osprey. This one was taking some branches back to his nest. 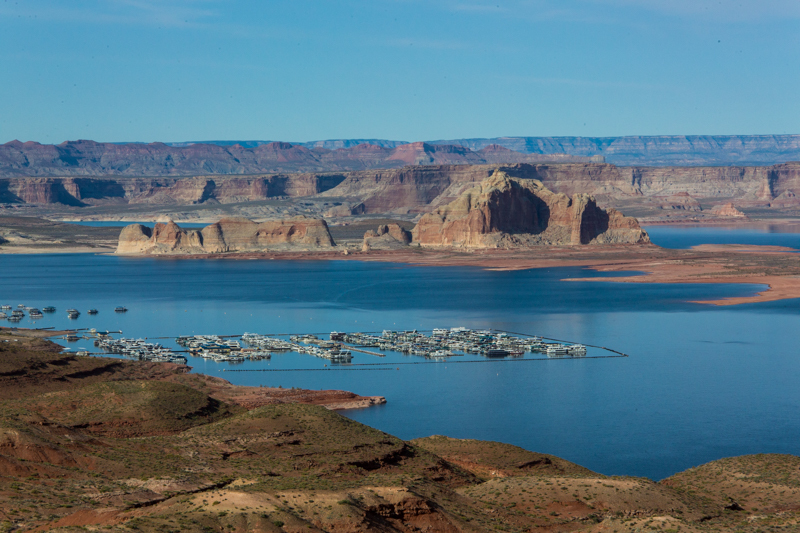 And lastly, one more picture of beautiful Lake Powell. Charlie is still feeling under the weather, but it is time to move on to Monument Valley. More on that later….. 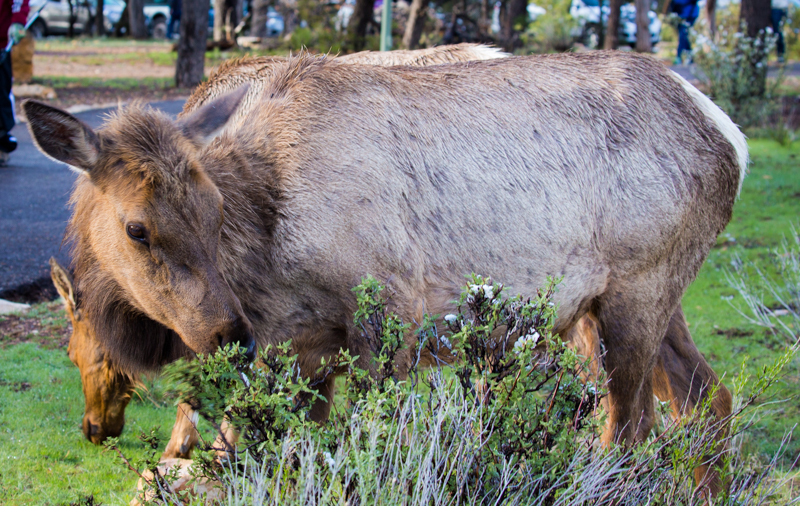 When we arrived in the Grand Canyon National Park we were welcomed by an elk cow. I didn’t even know what an elk cow was before we went to the Grand Canyon. 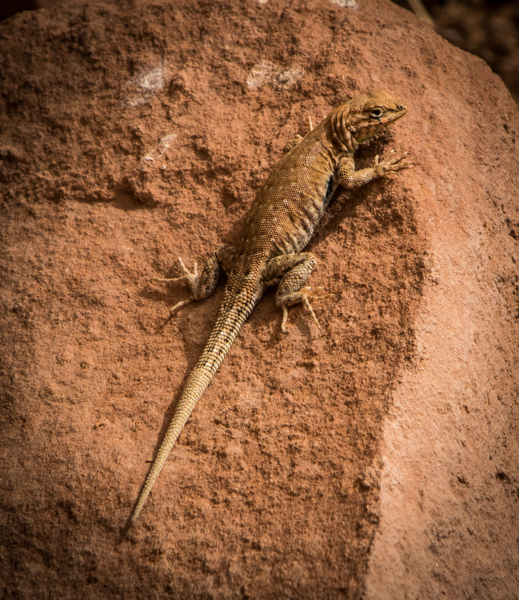 They are all over the campground and canyon. 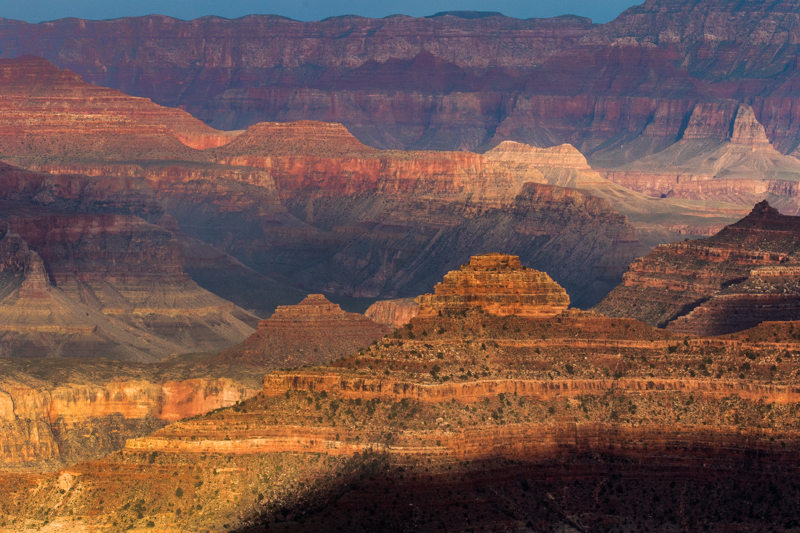 After we parked the RV at the Grand Canyon Village RV Resort we headed over to the visitor’s center. 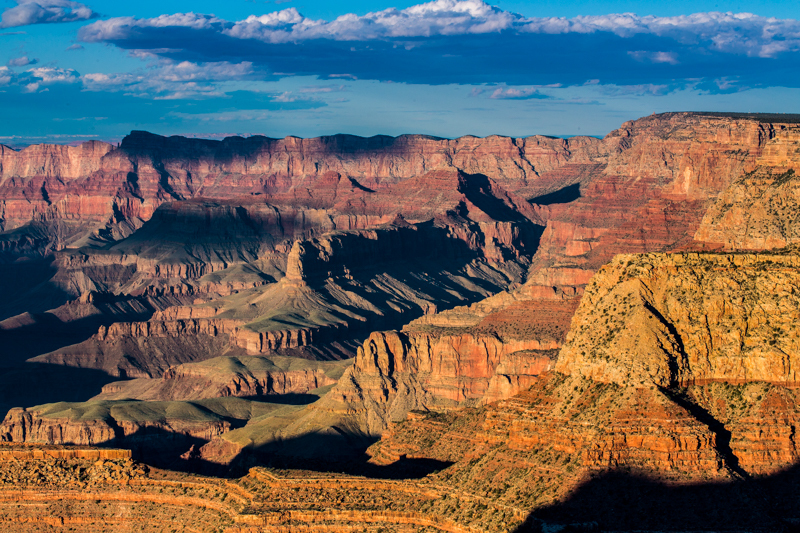 The Grand Canyon South Rim park covers just a small section of the entire Grand Canyon, about 30 miles of it. In order to see the west area of the G.C. 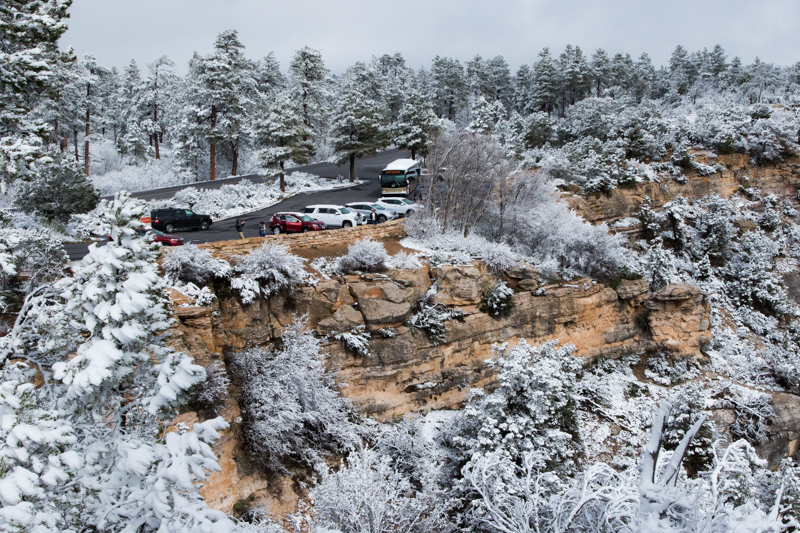 South Rim park, during this time of the year, you need to either walk, bike or take a bus. 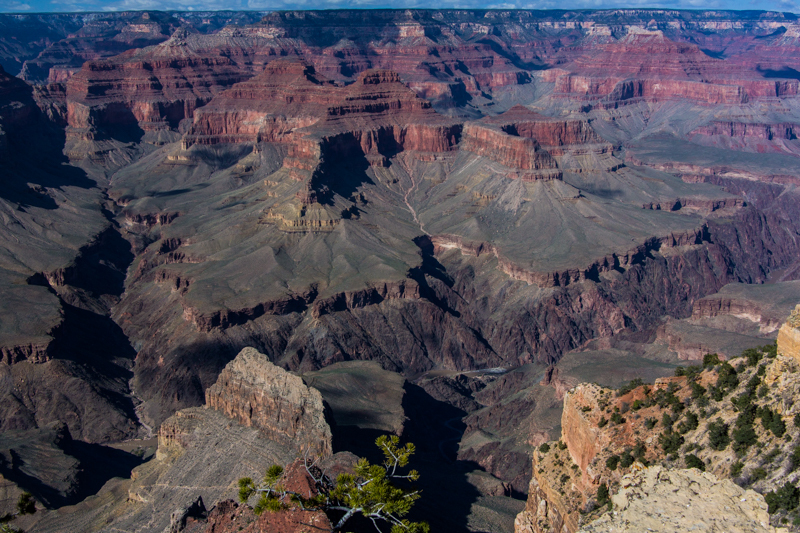 The bus stops at 9 points along the rim and takes about 80 minutes roundtrip. Because it was later in the afternoon when we arrived we chose to simply check out the rim behind the Visitor’s Center and then explore more over the next couple of days. We woke up the next morning to a dusting of snow on the ground. I was thrilled. 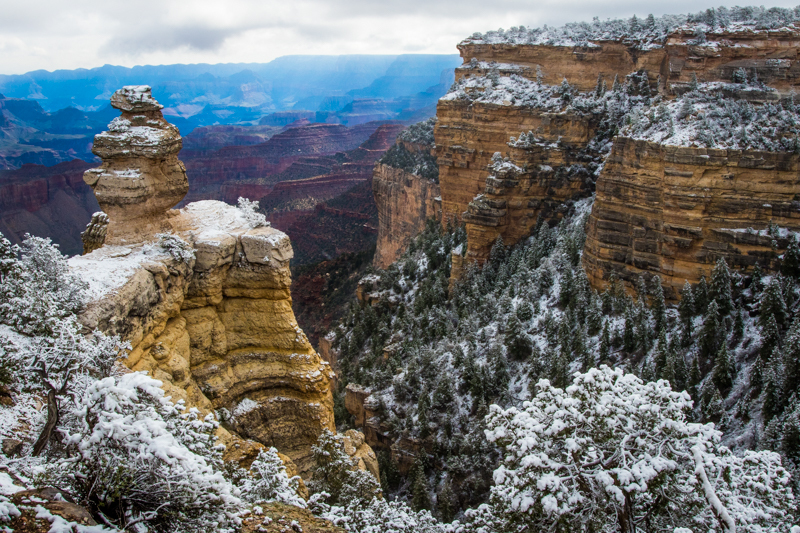 I couldn’t wait to capture some pictures of the canyon with snow on it. Because it was so cold we did a car trip, as opposed to a hike. 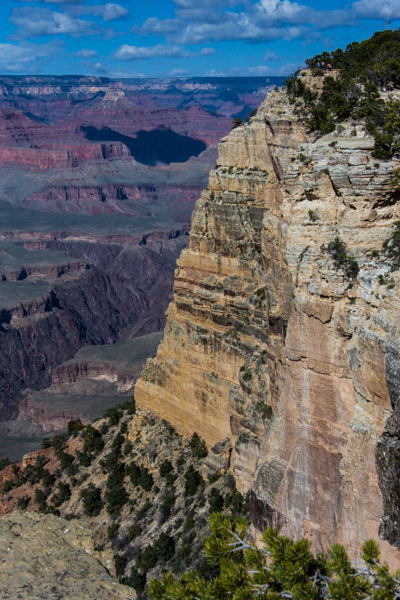 The Desert View Tower is 22 miles to the East of the Visitor’s Center. 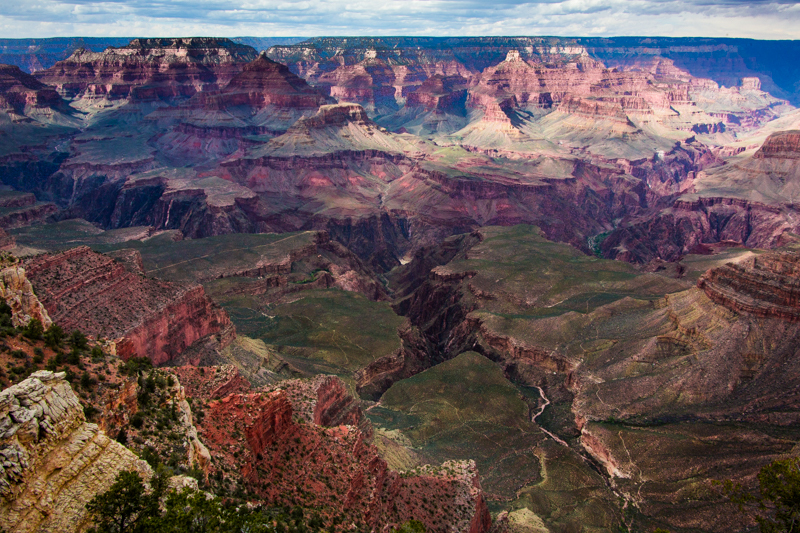 Along the route are a number of great canyon viewing areas. 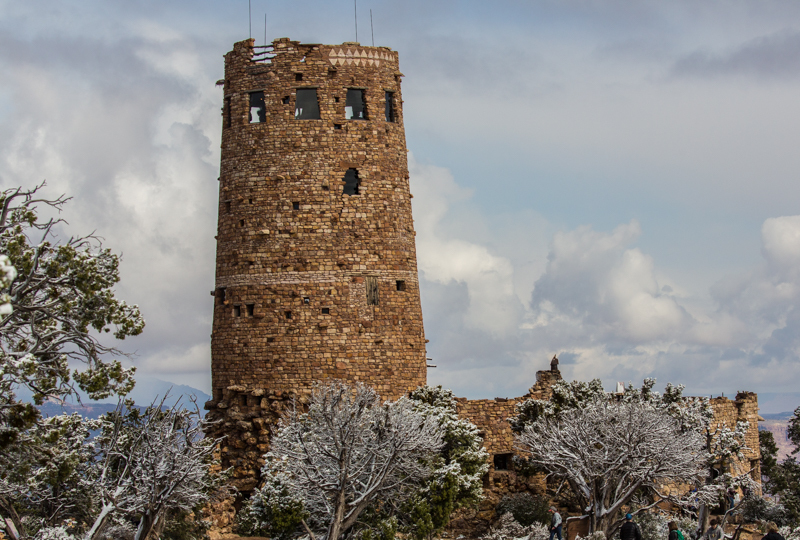 We found a bit of snow at a couple of the points, but it diminished as we approached the Tower, due to its lower altitude. 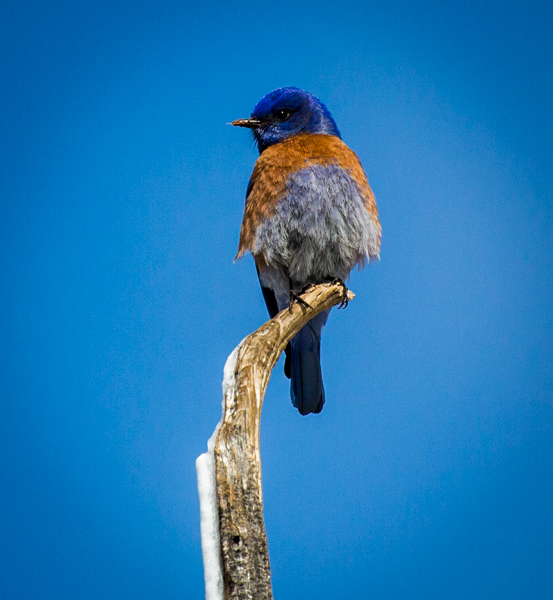 At the Tower, I found a Yellow Bluebird resting on a snow covered branch. 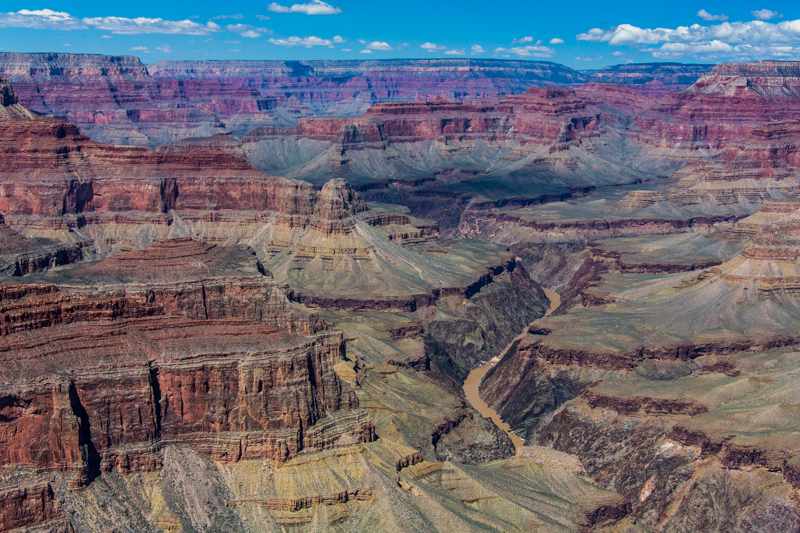 From the Tower you are able to see the Colorado River snaking through the canyon. In the distance the low clouds spilled over hills of the canyon. By late afternoon the clouds had diminished so we headed out to the west side of the park. 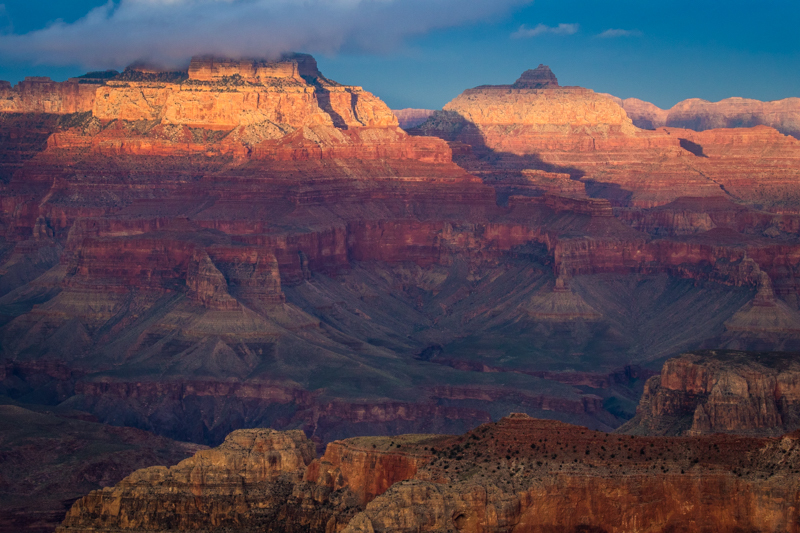 We took the bus to Hopi Point, as it is noted as being good for sunset photography. The next day we hopped on the west rim bus and took it to the end of the route, to Hermits Rest. From there we began our hike along the canyon rim. 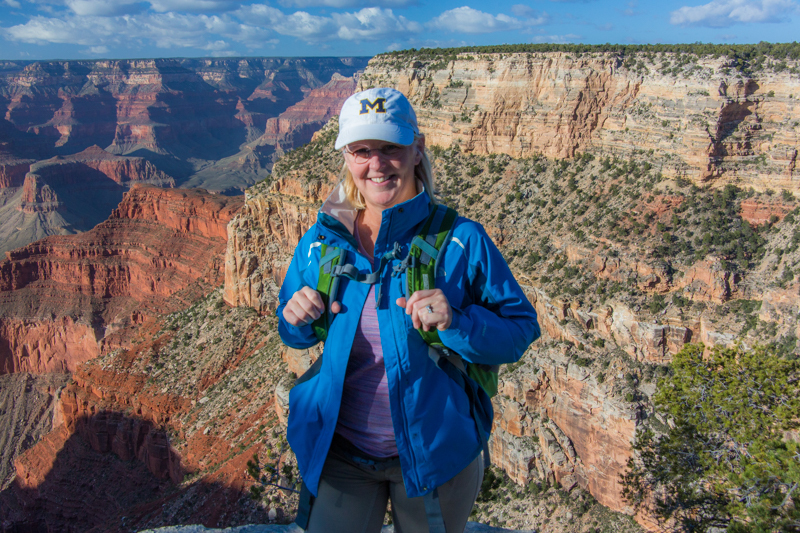 We hiked 6.2 miles to Powell Point. 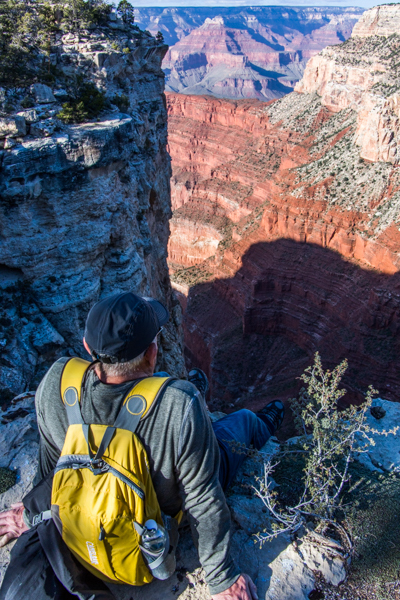 At times, we found ourselves precariously close to the canyon’s edge. In the picture below you can see the trail skirting the edge. As if that wasn’t close enough, Charlie decided to hang out over the edge. 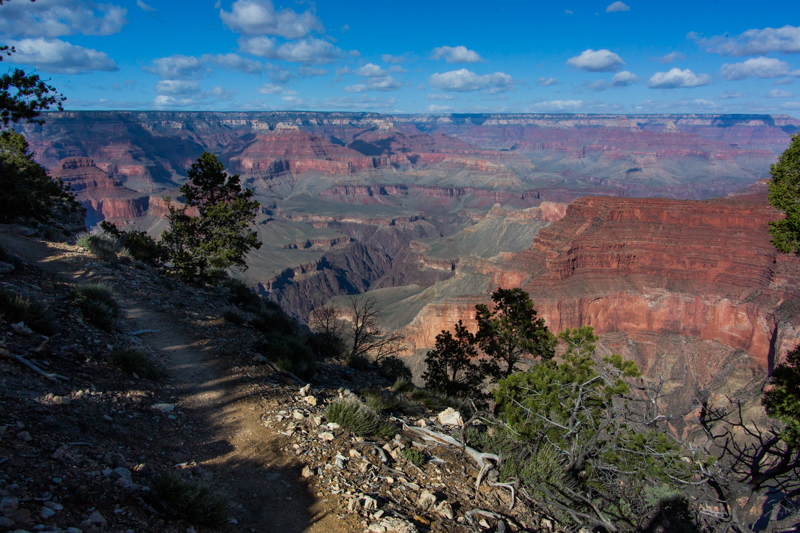 Below are some of the pictures I captured of the canyon during our hikes. 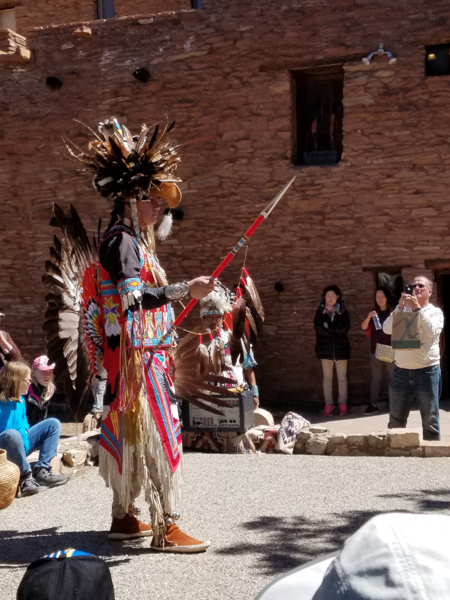 Back at the Canyon Village Center we watched an Indian performance. For our last evening we headed to Grandview Point for sunset. 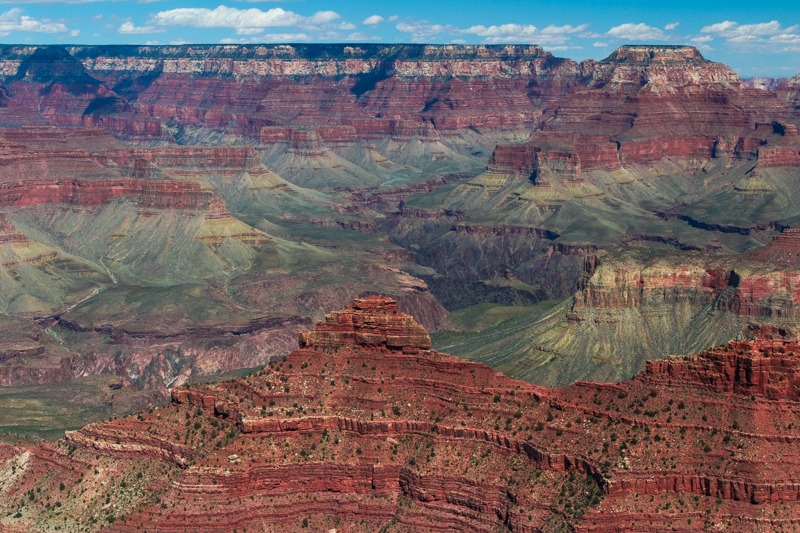 It is one of my favorite points along this area of the rim. 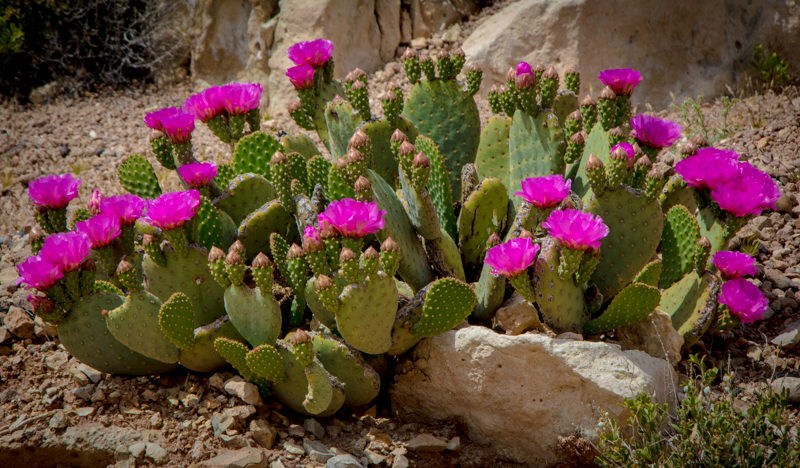 I think my second favorite is Pima Point. Then again, they are all beautiful. We only had two full days in Sedona so we worked hard to optimize our time. We stayed at the Rancho Sedona RV Resort, located right in the heart of downtown Sedona. It is a very nice resort, but like so often, we did not spend much time in there. We were busy exploring the area. 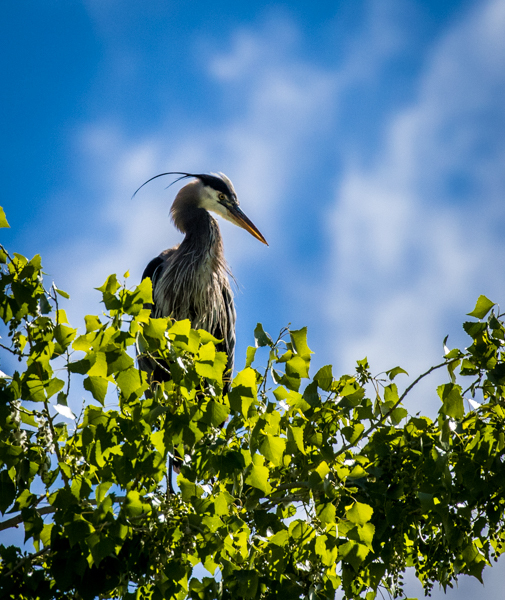 In the trees, within the resort, there are a number of Blue Heron nests. 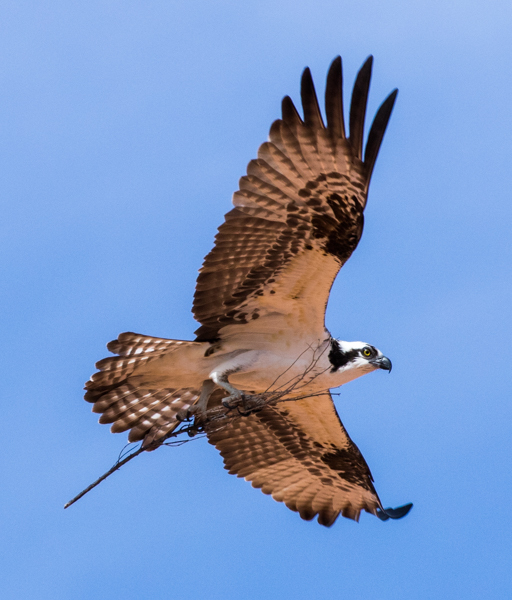 We frequently spotted the herons flying over our RV. Below is a picture of one of the herons in his/her nest. On our first morning in Sedona we awoke early and headed to the Airport Mesa for sunrise. 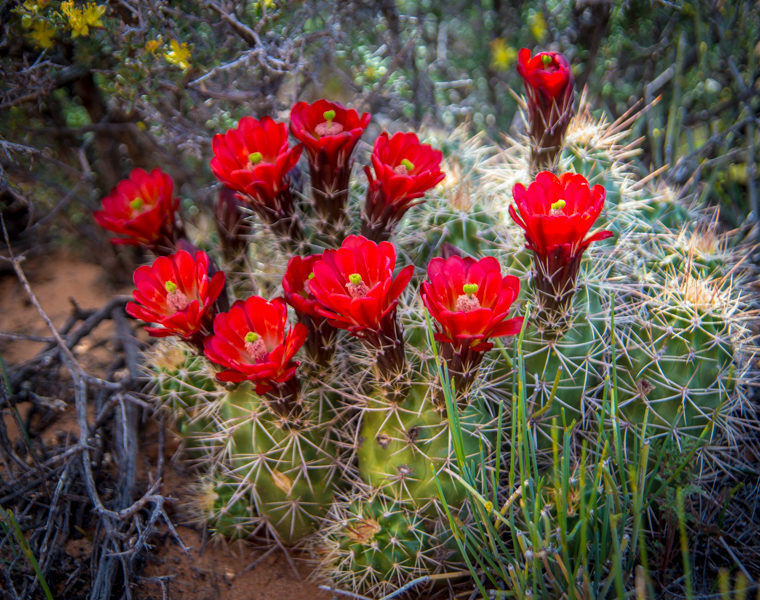 The landscape glowed in red, as the sun rose up behind us. Later in the day we went for a great hike. The skies were fairly cloudy so I wasn’t able to get great photos, but we really enjoyed the hike and scenery. We had many mountain bikers ride past us. What a great area for that! The following day we took a drive around the area and enjoyed a few short hikes with fantastic views. 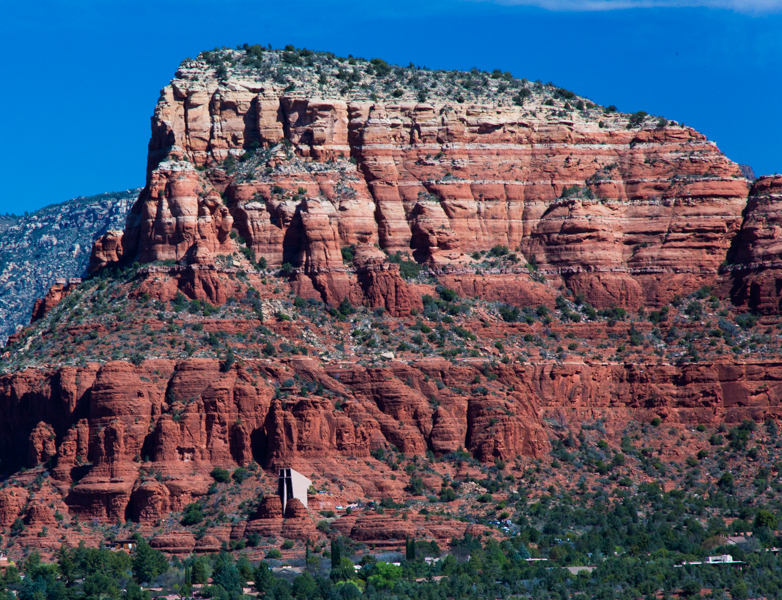 Below is a picture of the famous Chapel of the Holy Cross, built into the Red Rocks. You have to look very close to see the church in the mammoth sized red rock. 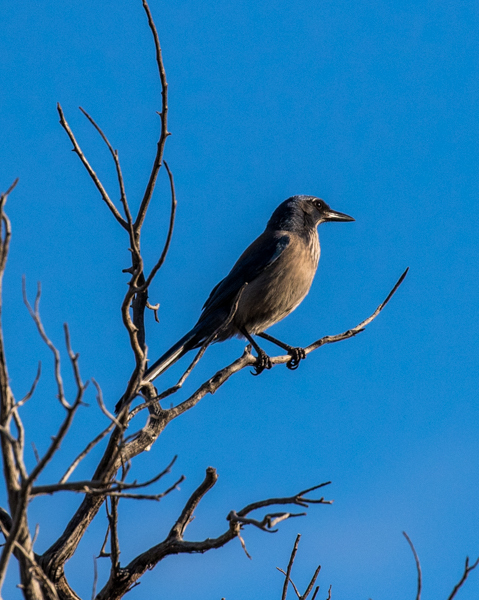 We also spotted a bird waiting for me to take his picture. While driving around the area we stumbled into the small town of Cottonwood. 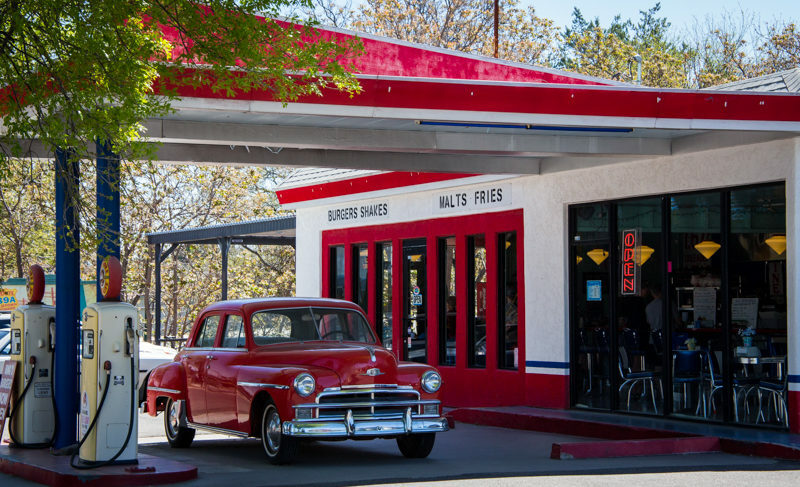 Now, Charlie and I absolutely LOVE French Fries so we decided that we just had to stop by this cute diner for fries and a malt. They were great! For sunset we headed to Mt. Doe. 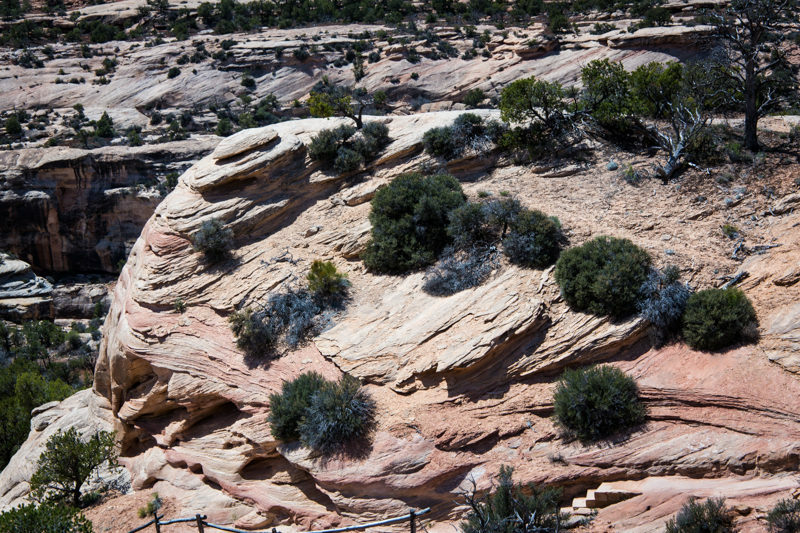 It is a 0.7 mile hike up 400 ft, so not too difficult. It was close to sunset time so we hustled up the mountain. We were rewarded with a pretty sunset. We even had time to capture a couple of selfies. 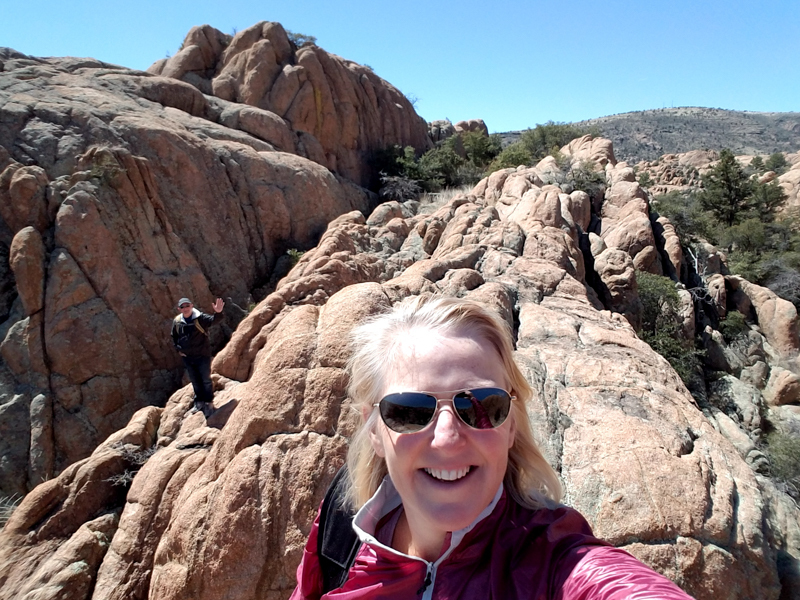 When we arrived in Prescott the weather was beautiful. 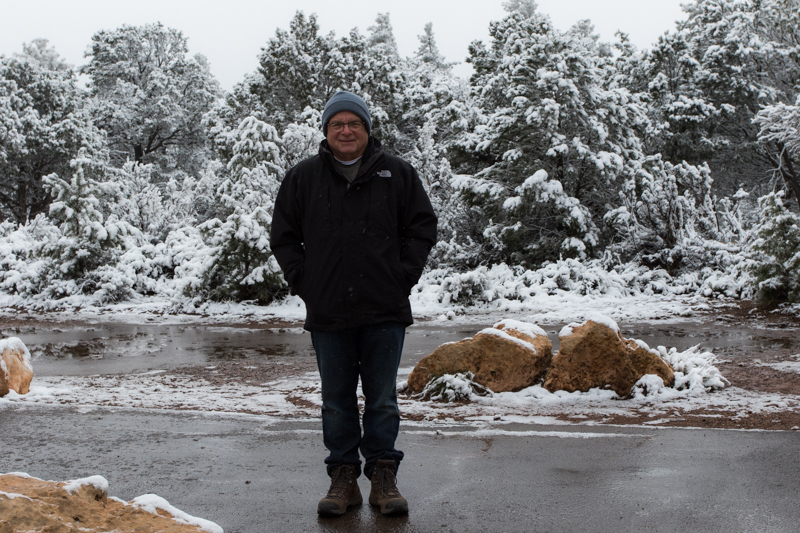 It felt cool and refreshing, after having been in Tucson and Phoenix for the past couple of weeks while they were experiencing 15+ degree hotter than normal temperatures. We stayed at the Point of Rocks RV Park. Prescott hadn’t had precipitation for awhile and therefore, the park was quite dusty. The roads and sites are all gravel. Aside from that, we were happy with the site size and the surrounding area. The RV park is adjacent to the Watson Lake Park. After parking the RV we took a walk over to the park/lake. It is a very unusual lake with massive round boulders in and around it. 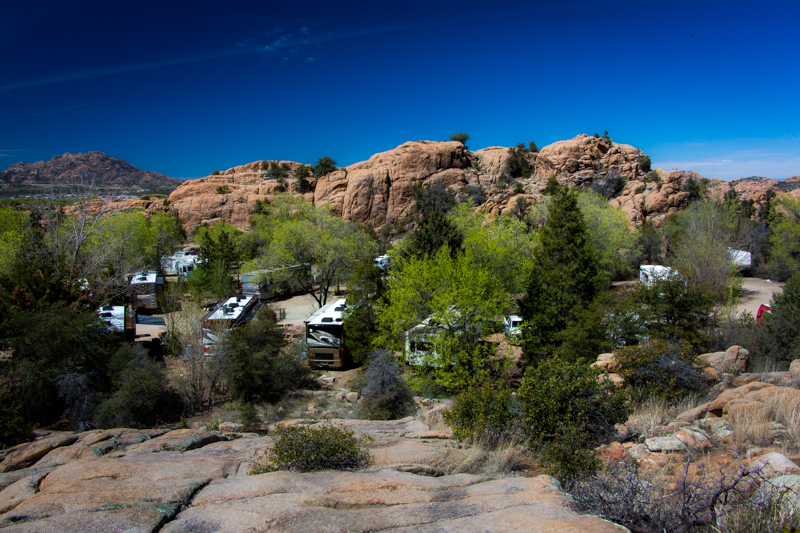 The photo below is of Point of Rocks RV Resort, as seen from atop the boulders. I decided to climb up and take a picture from above. 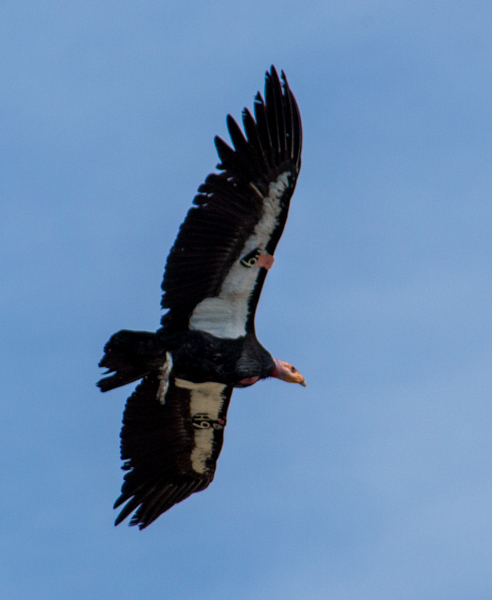 Who needs a drone, right? During our stay we took a day trip to Jerome. 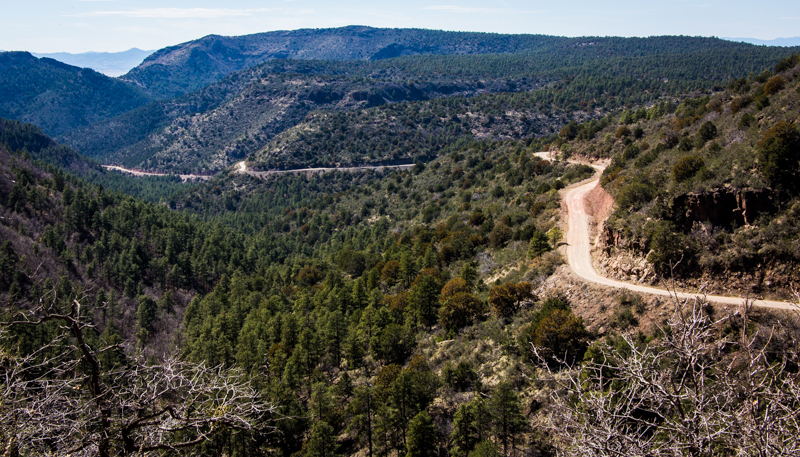 The drive there through the Prescott National Forest was fun, that is if you don’t mind hairpin type turns around steep mountain corners. 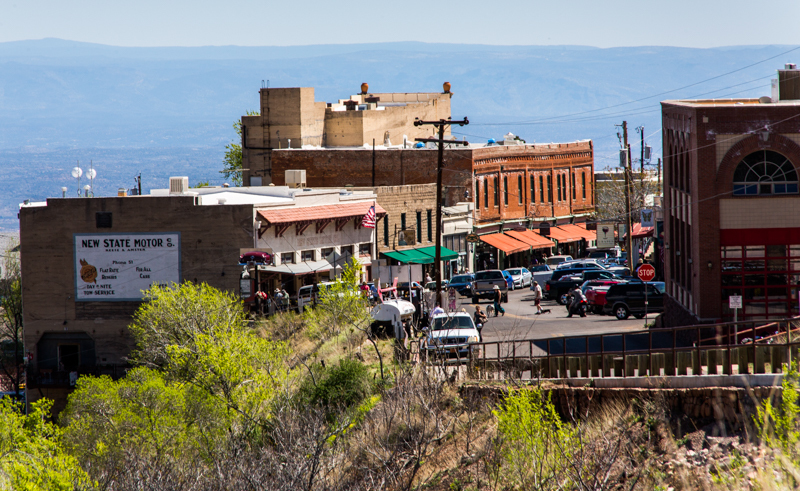 The weather was perfect for a walk around Jerome. My favorite shop was one that was filled with kaleidoscopes. I could have spent hours in there looking into each and every one on display. 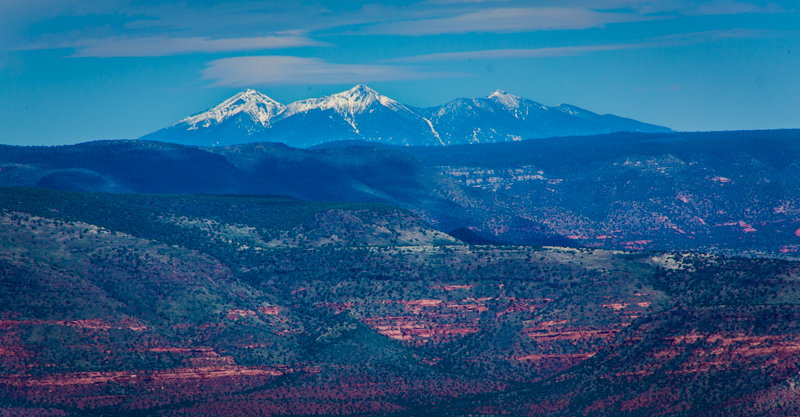 From Jerome you can see the red rocks of the Sedona area and the snow covered Flagstaff mountains in the distance. 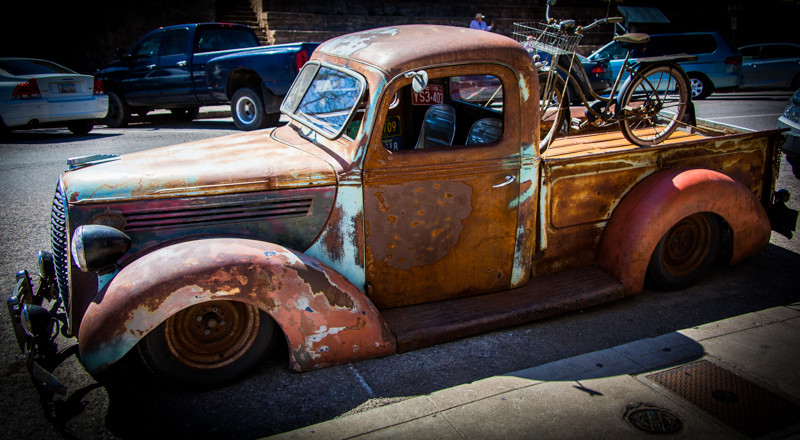 We spotted a pretty neat old truck parked on the street. Based on the plates, I’d say its been around. 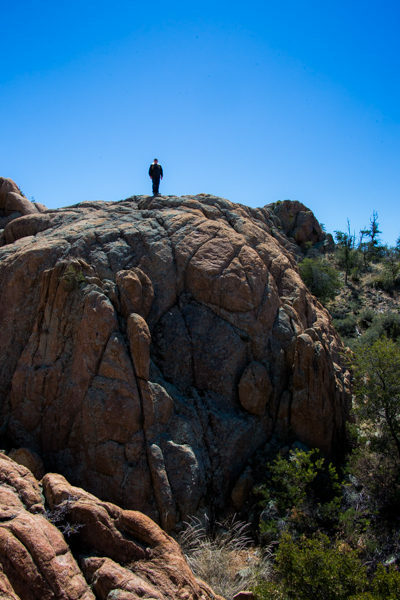 On the way back to Prescott we diverted to Mingus Mountain Recreation Area. After entering, we drove up a long dirt road on the edge of the mountain. It took us through the forest, but we ended up at a dead end. 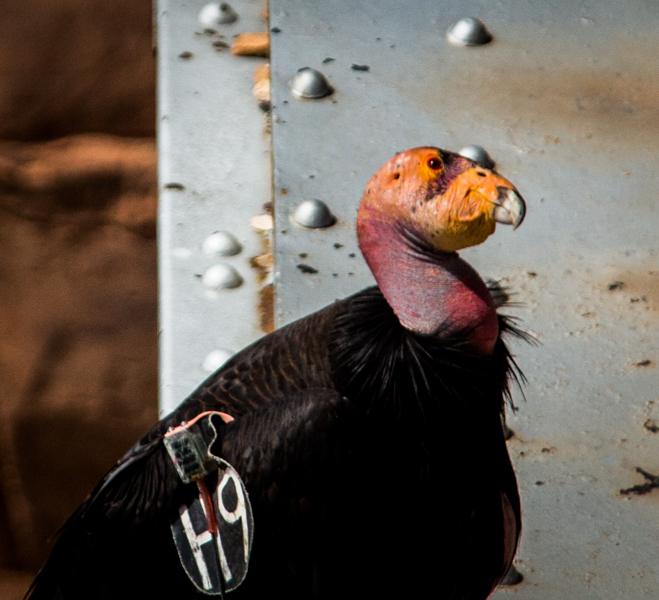 The park was closed for the season. We turned around and worked our way back down the mountain. We returned to the RV exhausted. For the next 2 days we hunkered down. The weather turned cold and rainy. We were happy to have a reason to stay indoors. 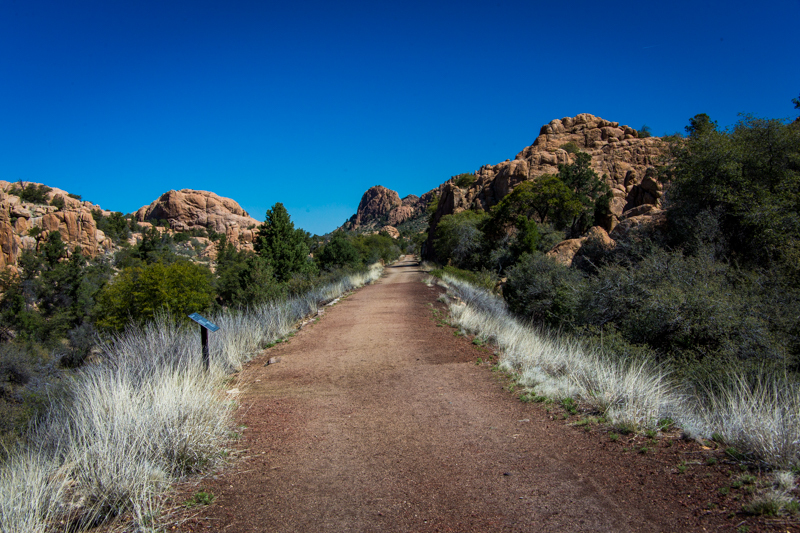 The sun came out for the last couple of days we had in Prescott so we seized the opportunity and took a bike ride. We biked the Rails to Trails path along Watson Lake. It was very scenic. At one point we parked the bikes and climbed up and over the rocks. We enjoyed the town of Prescott. One street in the square is called Whiskey Row. It was developed after a fire in 1900 destroyed the entire original block. During the rebuilding phase a large number of saloons were added. It is stated that at one point there were 40 of them. The high number of saloons was contributed to the gold rush culture that drew all kinds of settlers, cowboys, prospectors, gamblers, and outlaws to the town. Of course when you put saloons and cowboys together you eventually end up with shootouts. 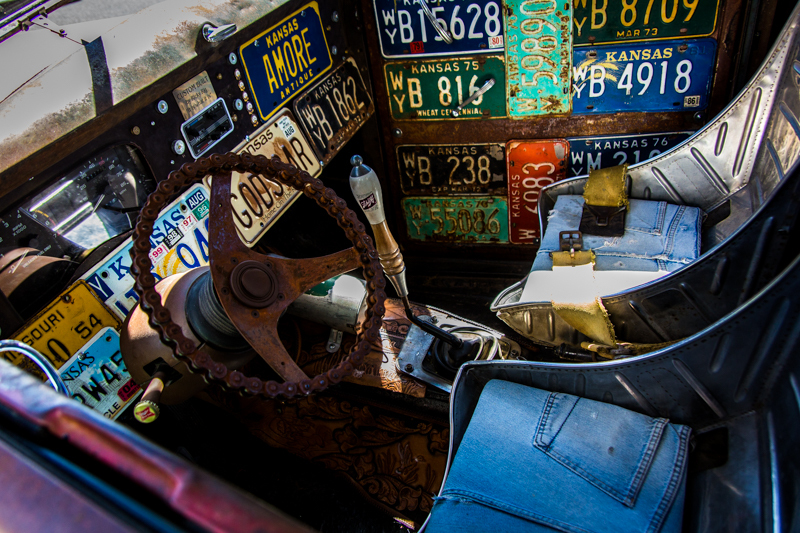 Prescott considers that part of their heritage and has annual shoot out events. Today Whiskey Row is lined with not only saloons, but art galleries, shops and restaurants. 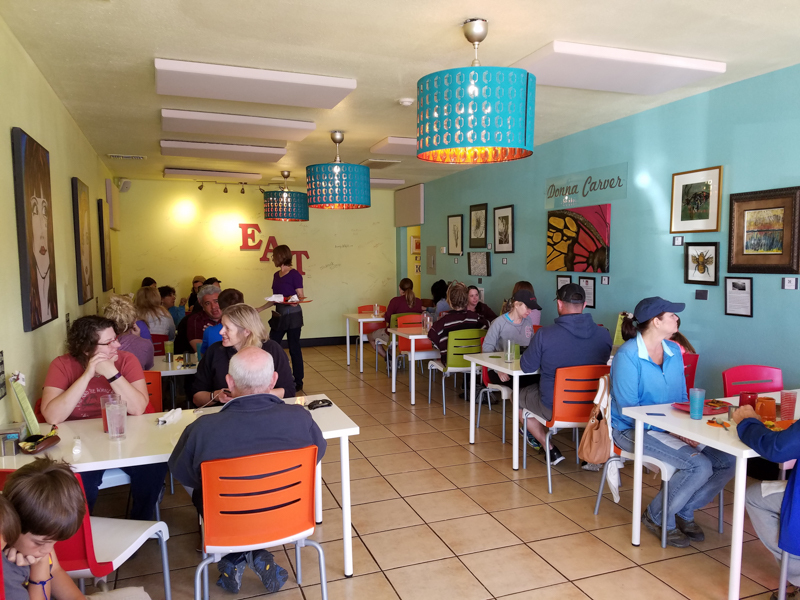 We were able to visit with some great friends while in Prescott and we were able to introduce them to a great restaurant in their town. If you are ever in the area, try out ‘The Local’: https://www.facebook.com/thelocalprescott . 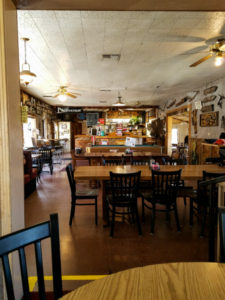 It is a very small, off the beaten path, restaurant with a unique breakfast and lunch menu. 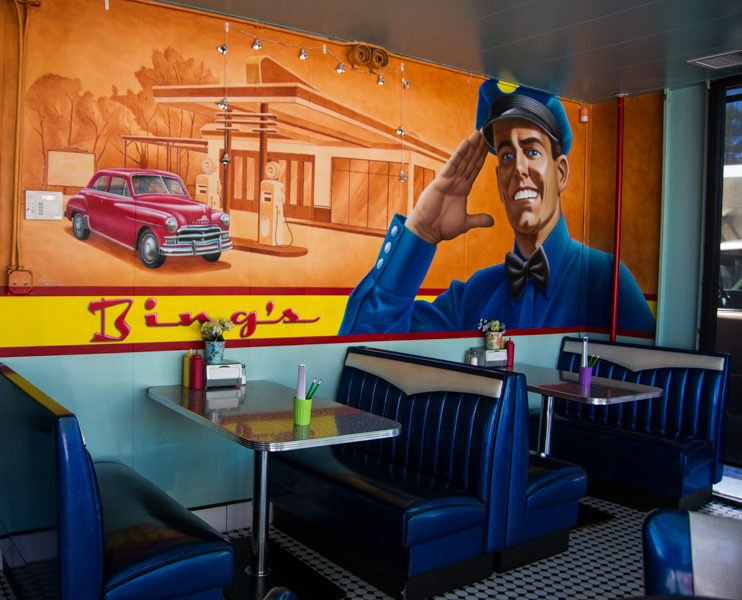 Their food is fantastic.